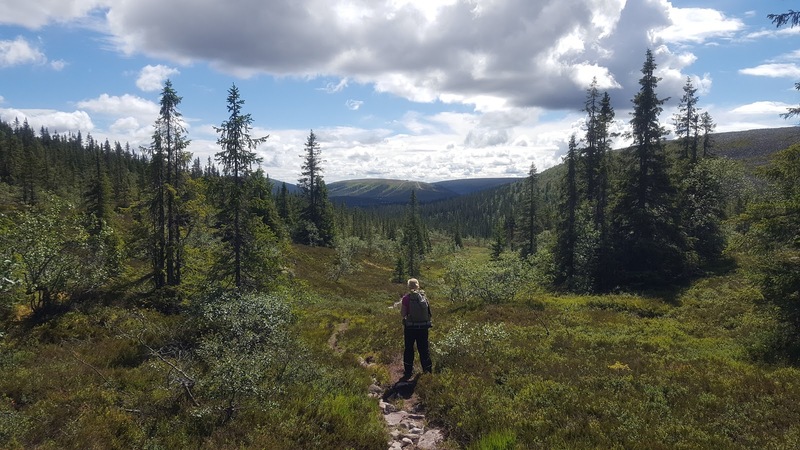 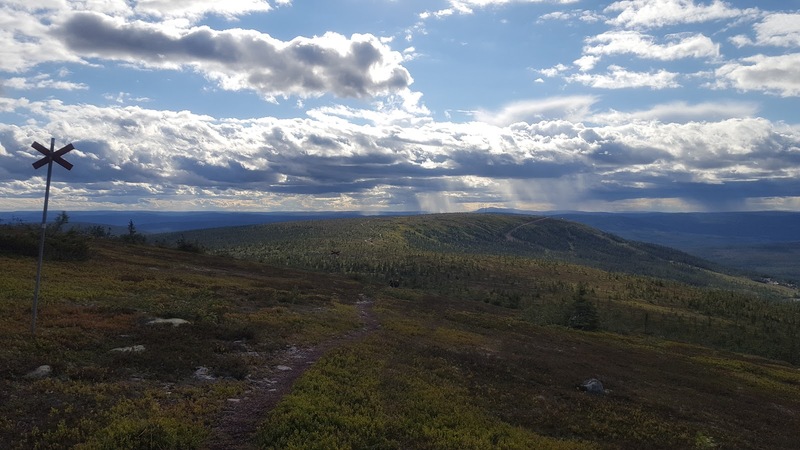 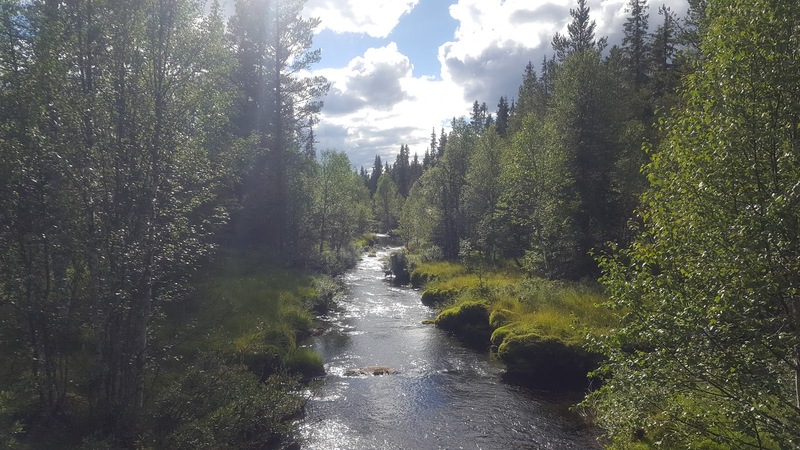 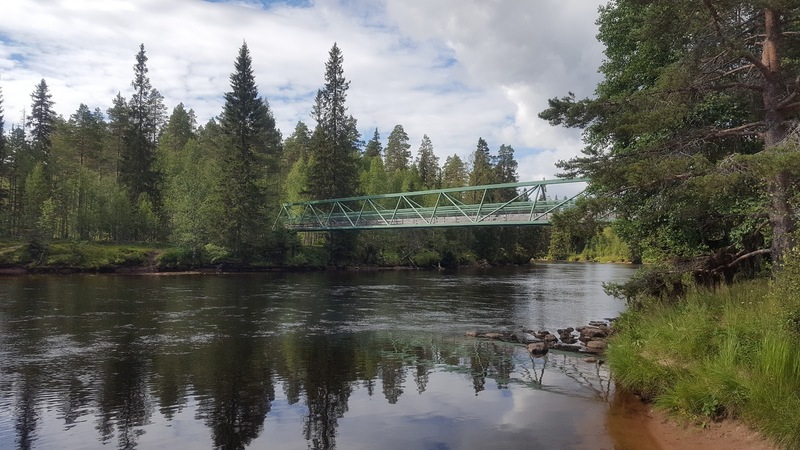 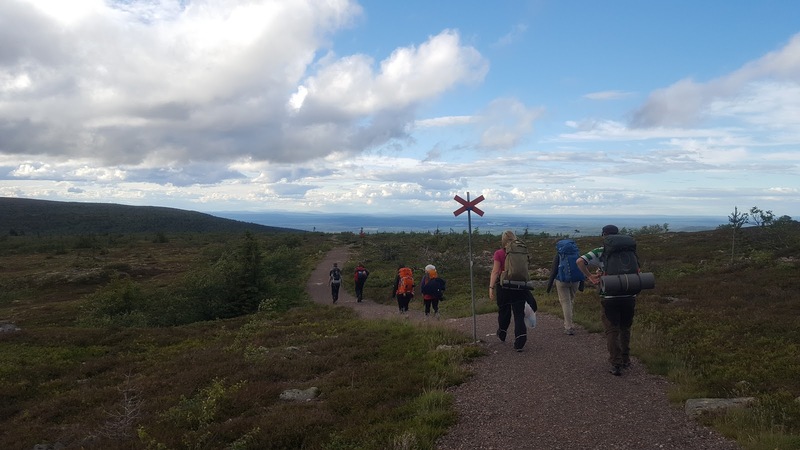 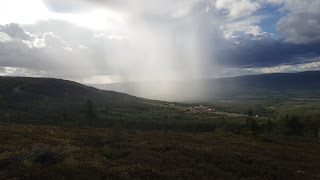 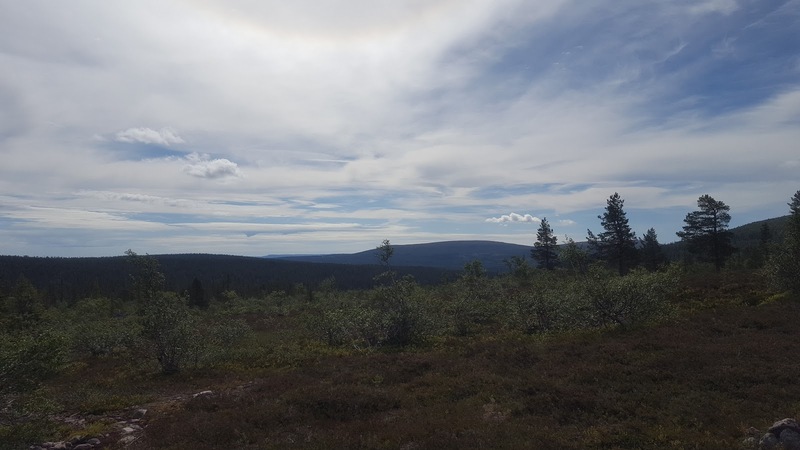 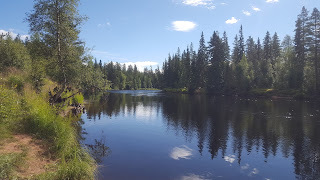 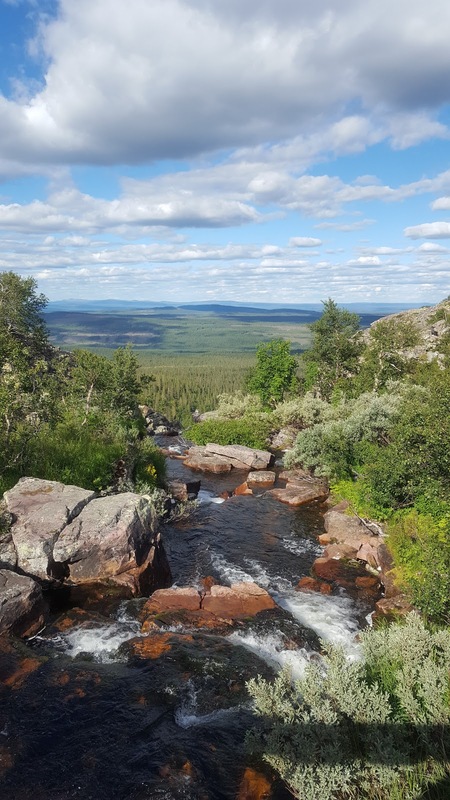 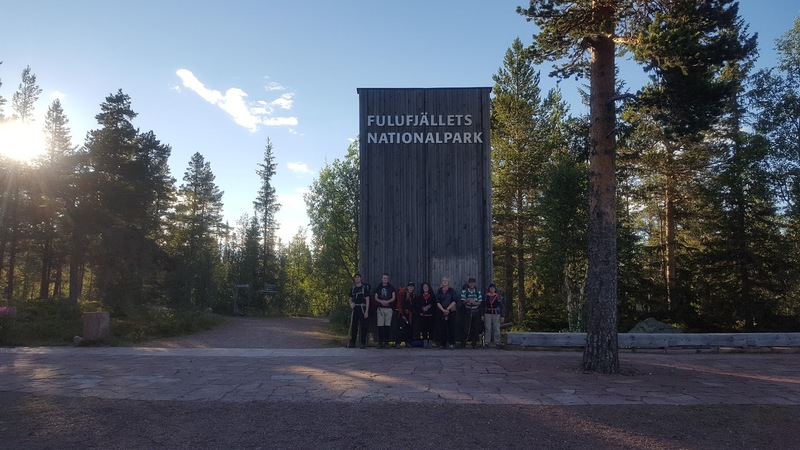 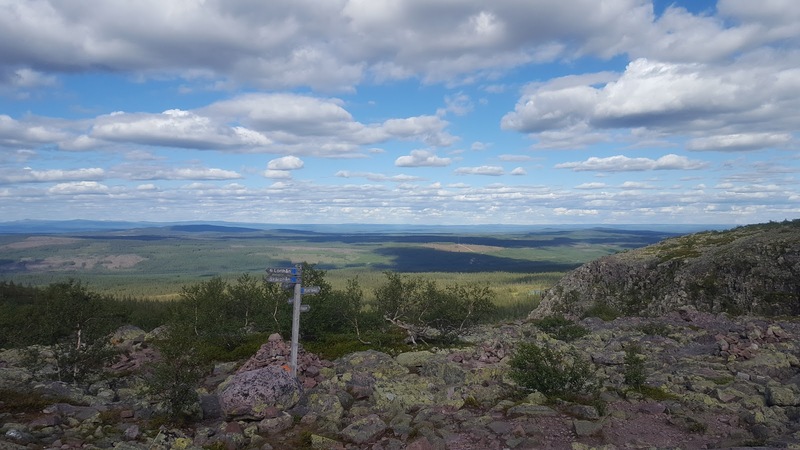 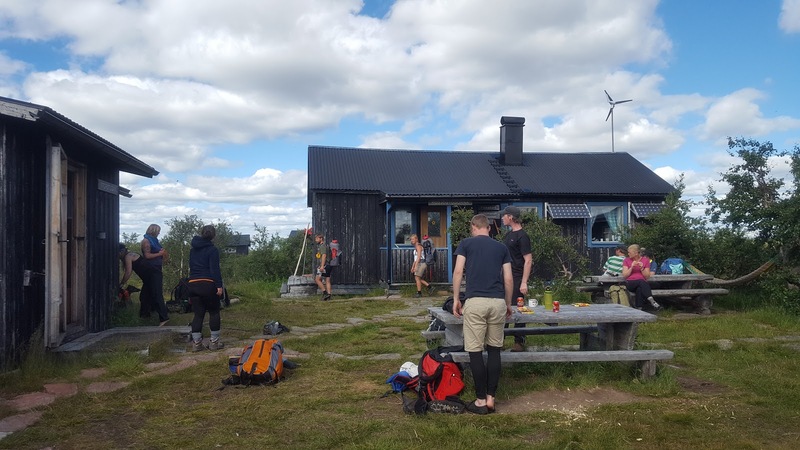 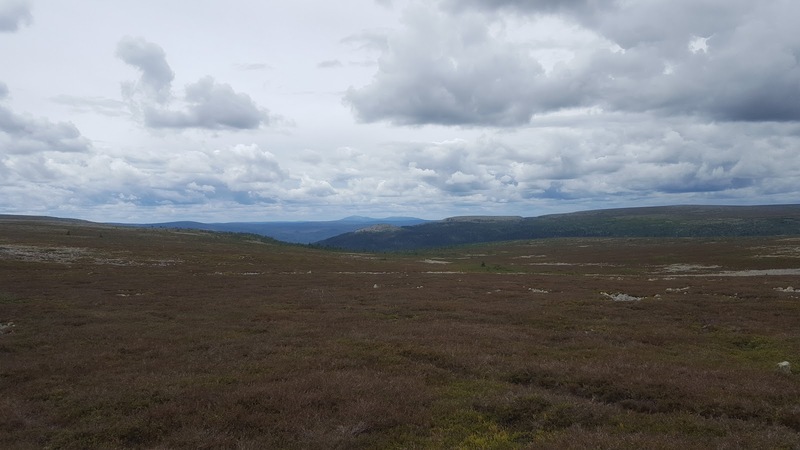 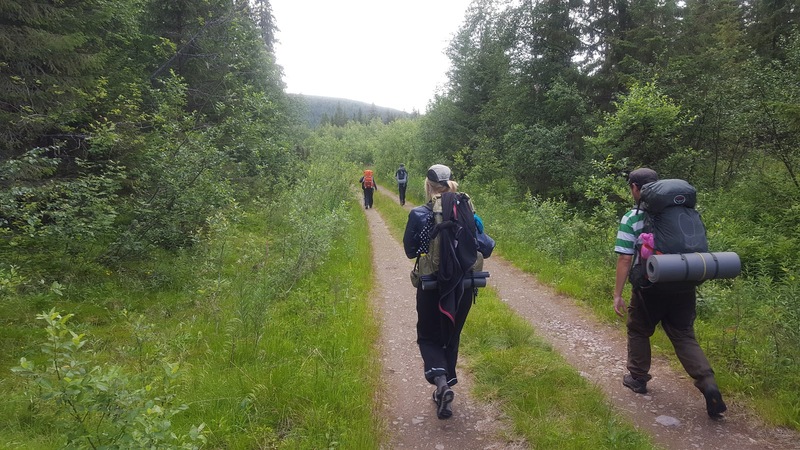 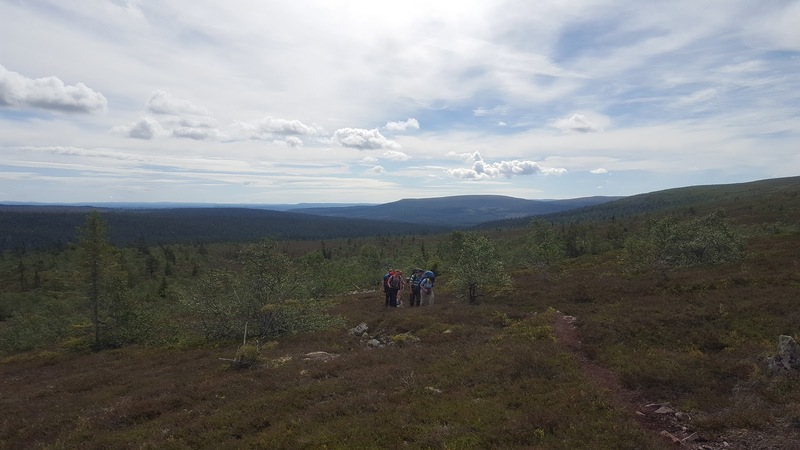 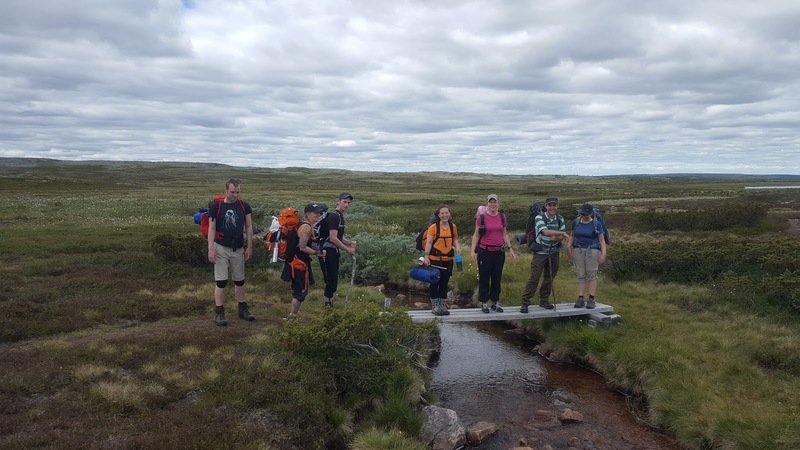 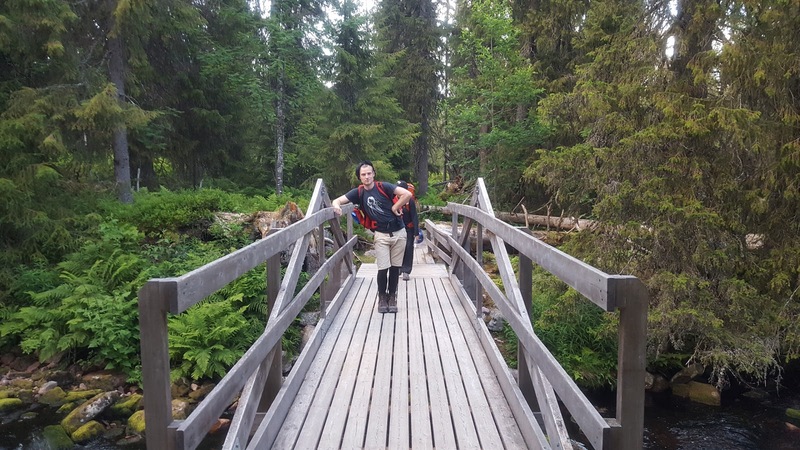 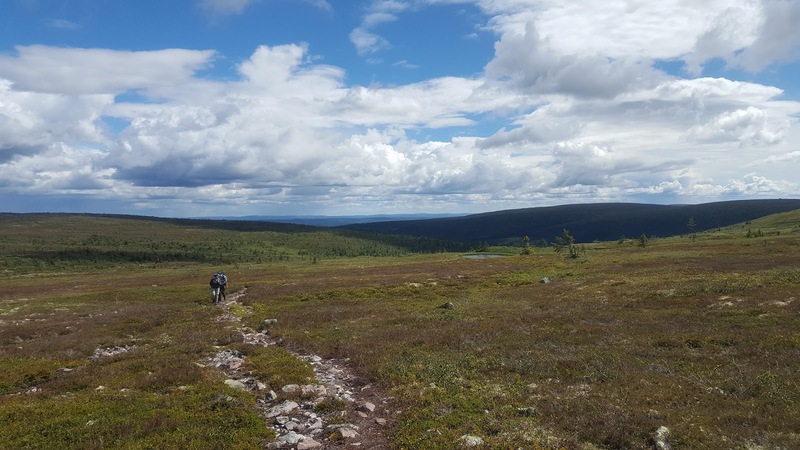 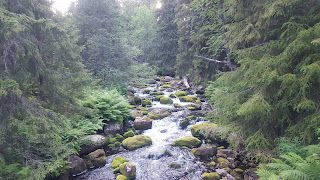 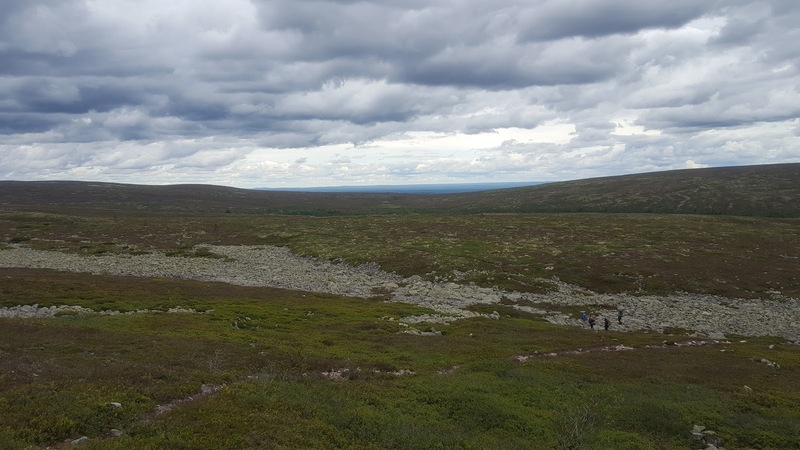 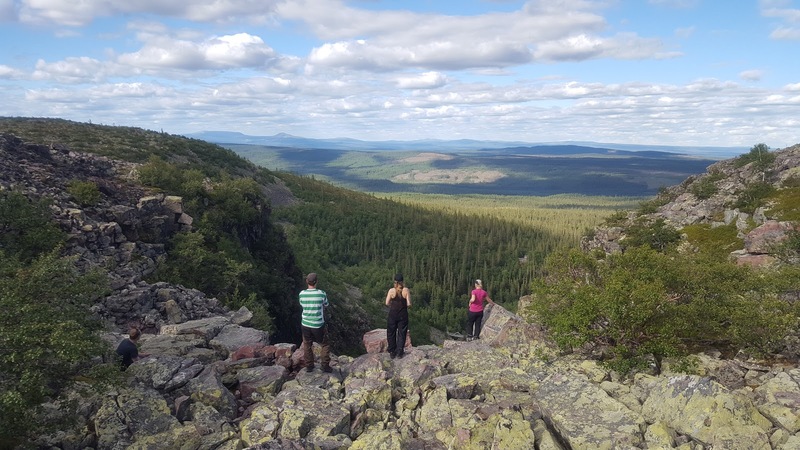 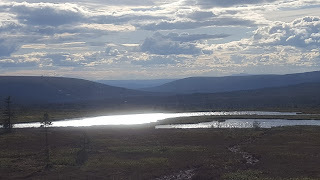 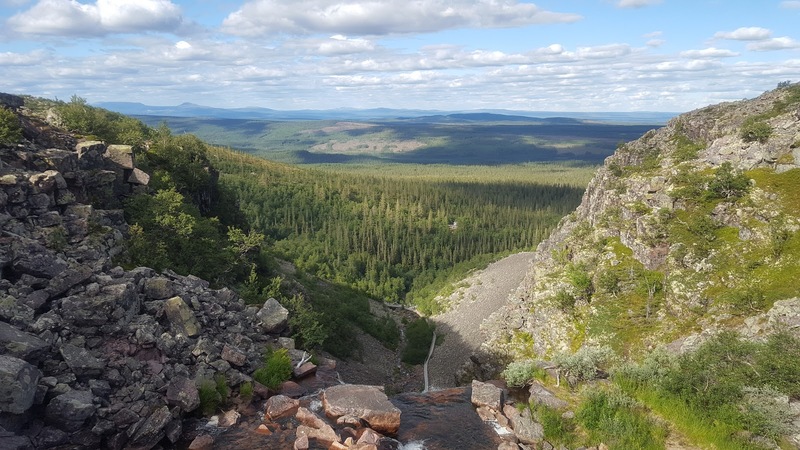 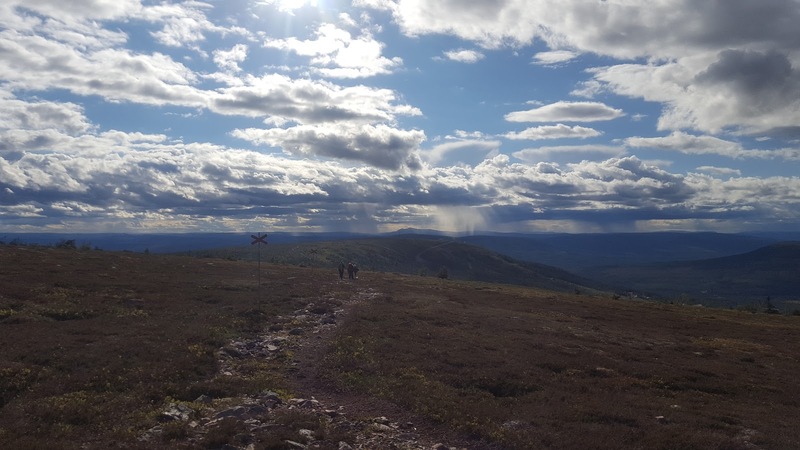 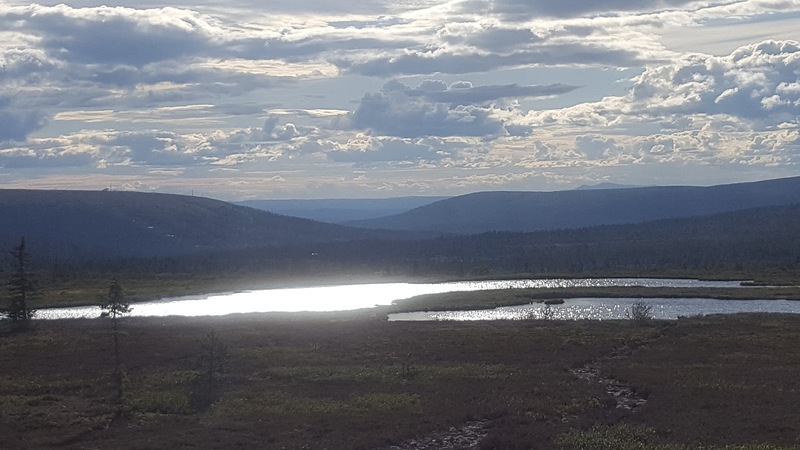 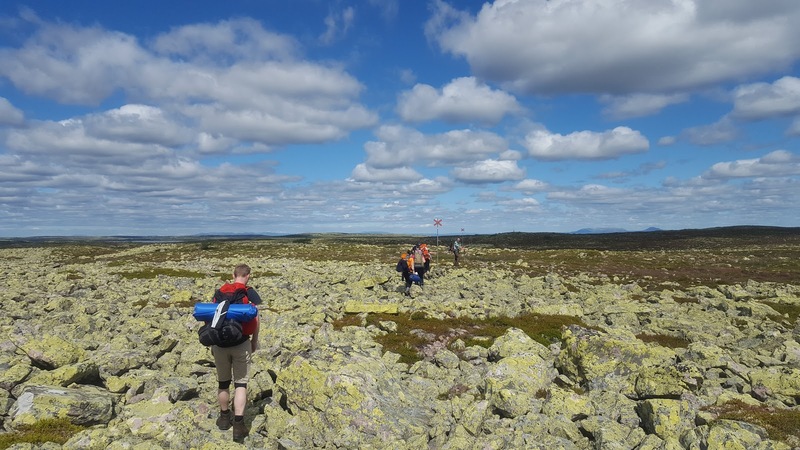 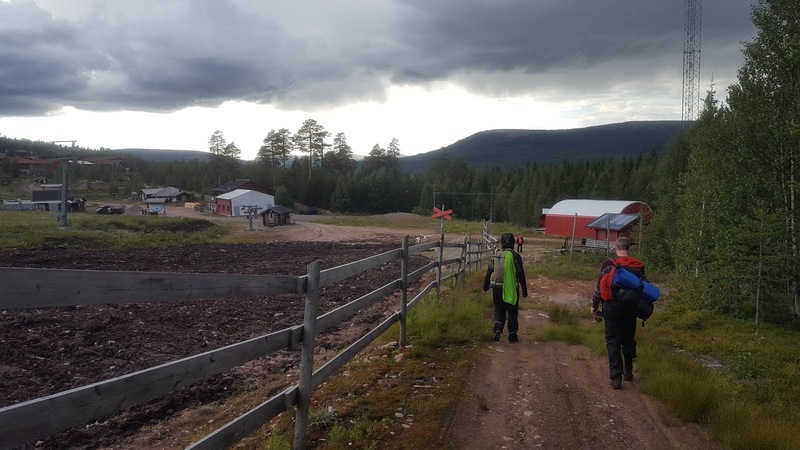 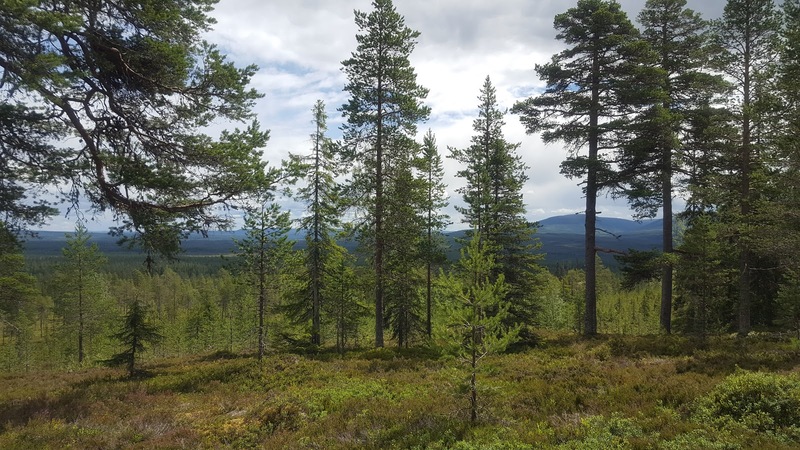 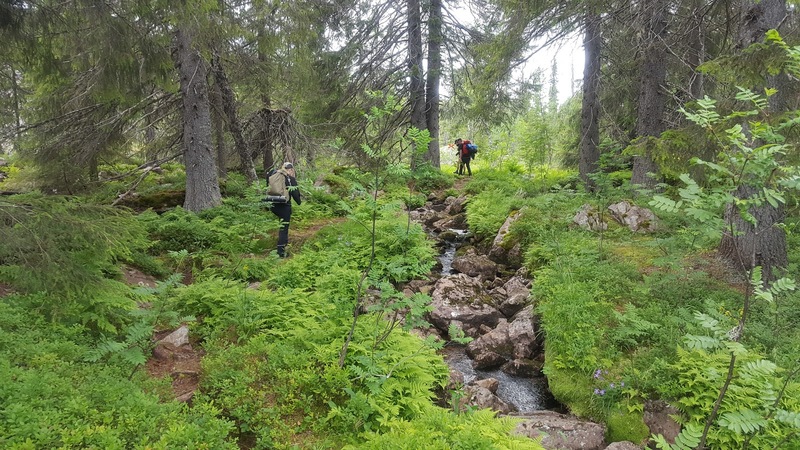 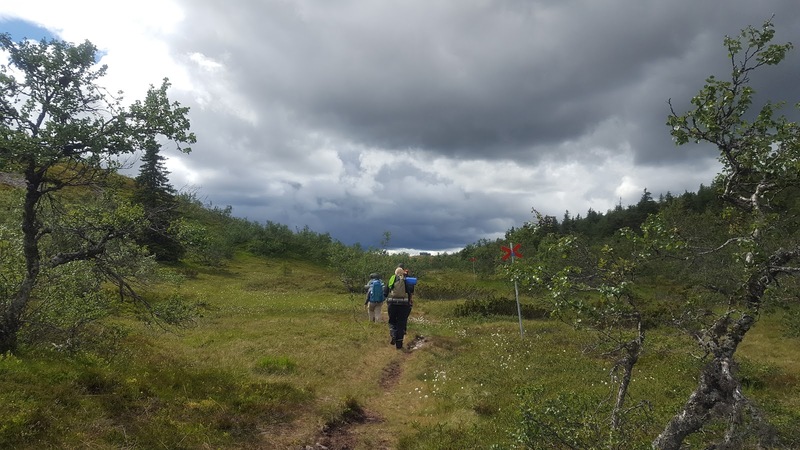 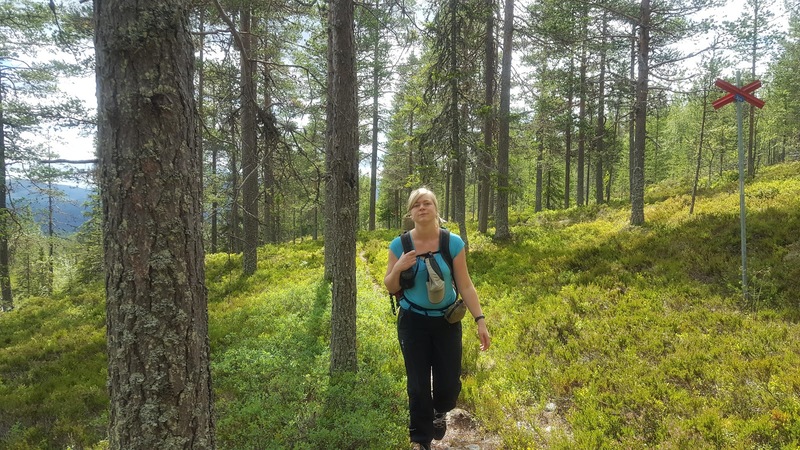 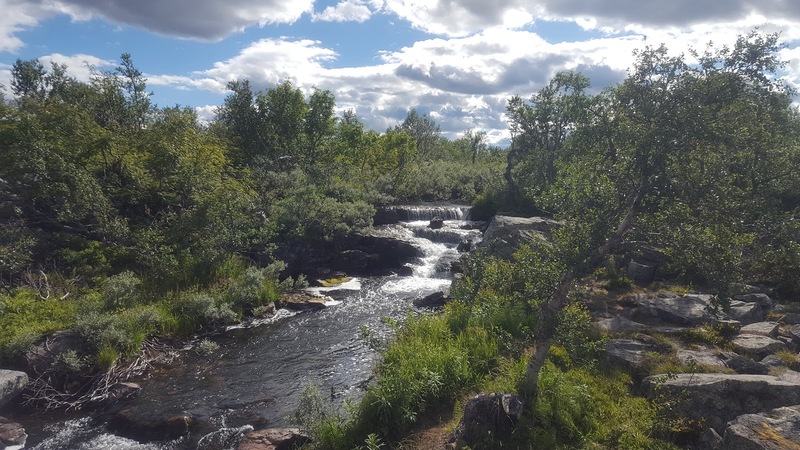 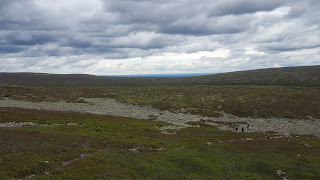 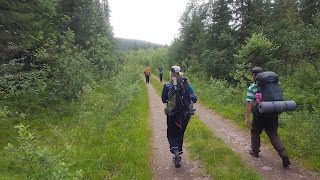 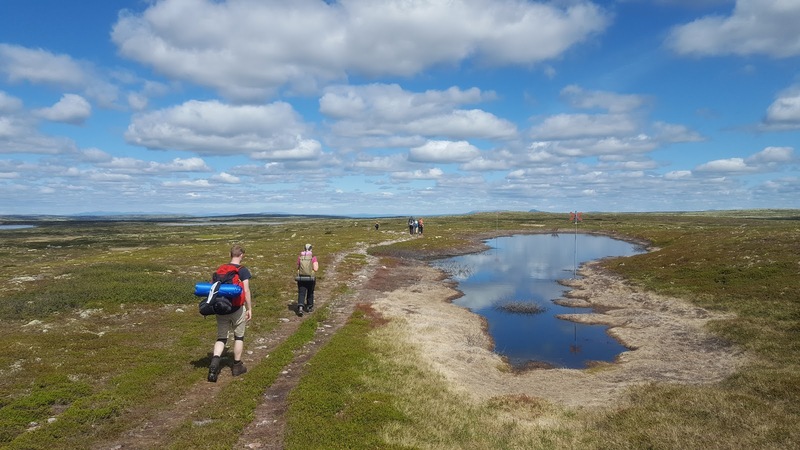 The E1 Trail connects Vasaloppsleden and Södra Kungsleden via the village of Sälen, and goes through a few nature reserves, most notably (and the largest) being the Fulufjället National Park. 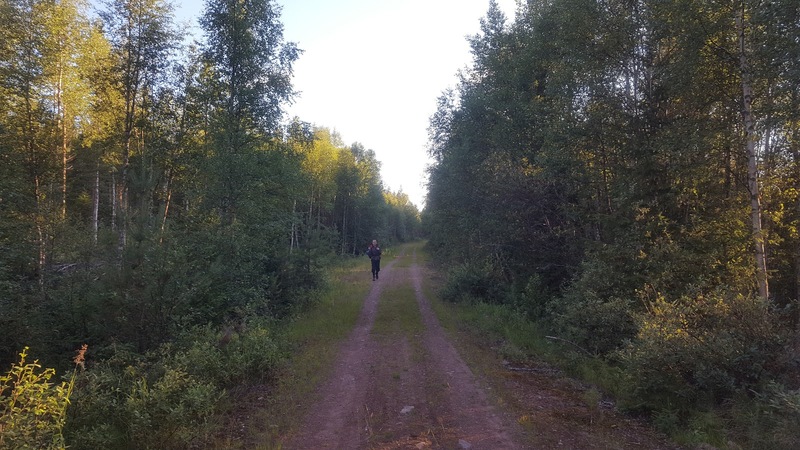 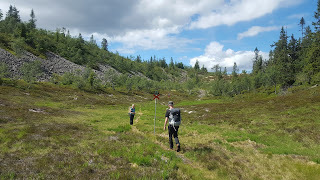 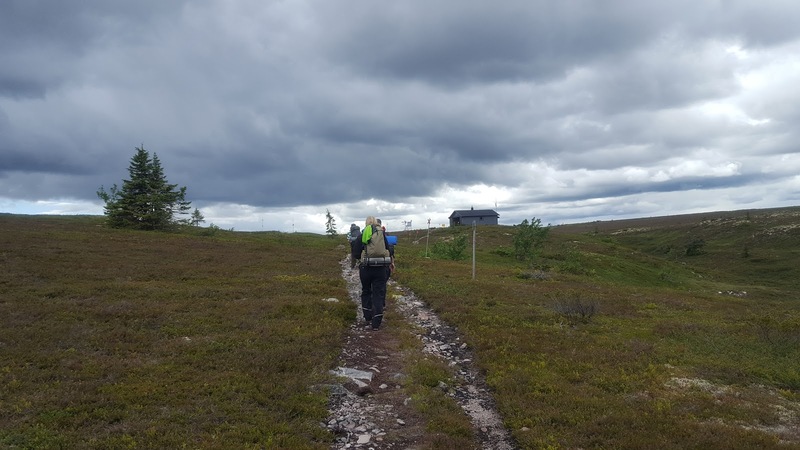 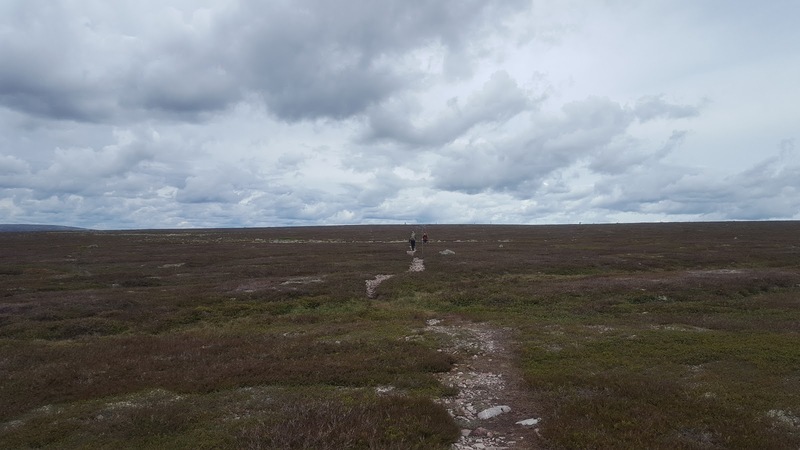 This is the second to last stages of the Swedish E1 trails in the north, and its length can vary considerably depending on how one chooses to hike it. 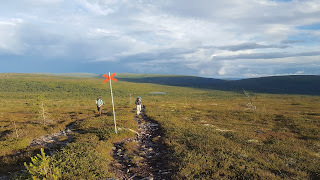 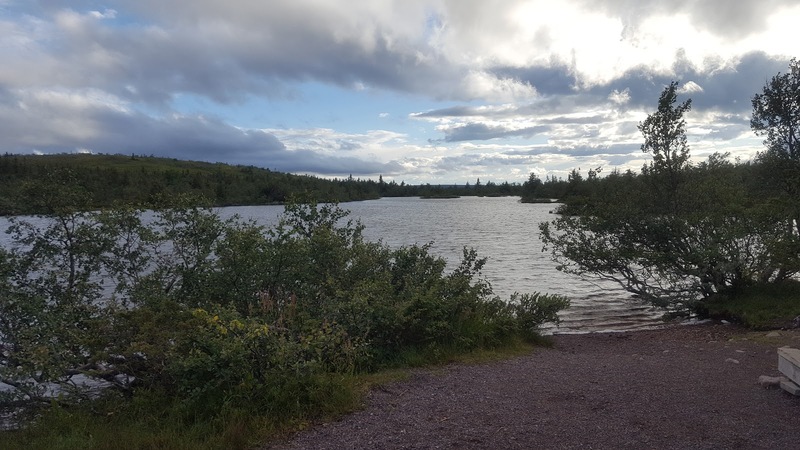 There are several side/alternative trails and potential loops that can be hiked, though on a map following the most direct route the length is roughly 80km. 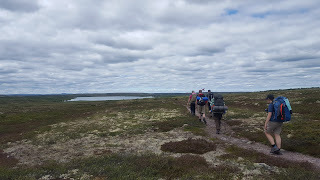 However the route my friends and I hiked ended up being around 110km according to an average of several smartphone pedometers we had with us. 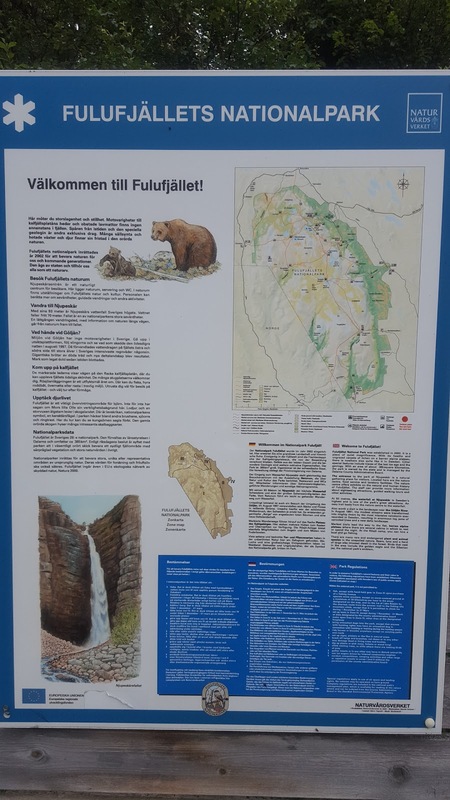 Here is a link to a basic map and general information of this area (in English). This stage presents some logistical challenges due to how isolated the area is, and will require plenty of planning ahead of time. 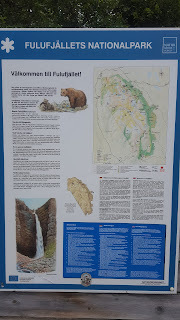 For the record the map we used was the Lantmäteriet Fjällkartan W2, Fulufjället-Sälen, November 2013 edition. You will absolutely need a good and current/updated map of the area and of course a compass, and I would personally advise doing this and the next and last stage in the same trip if you have the time. 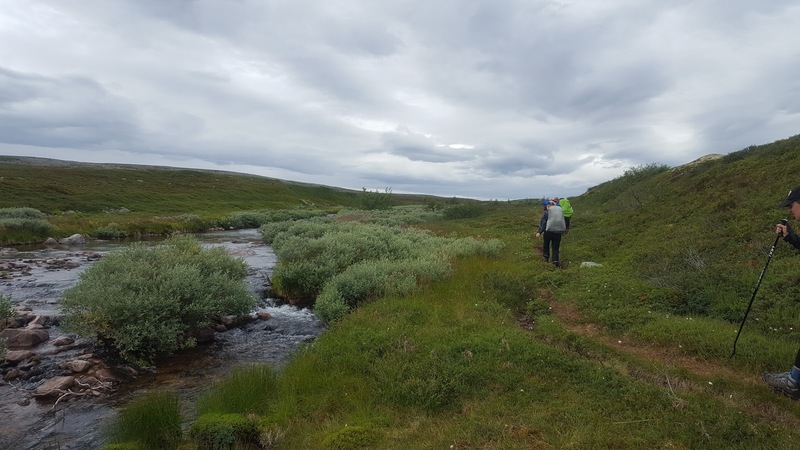 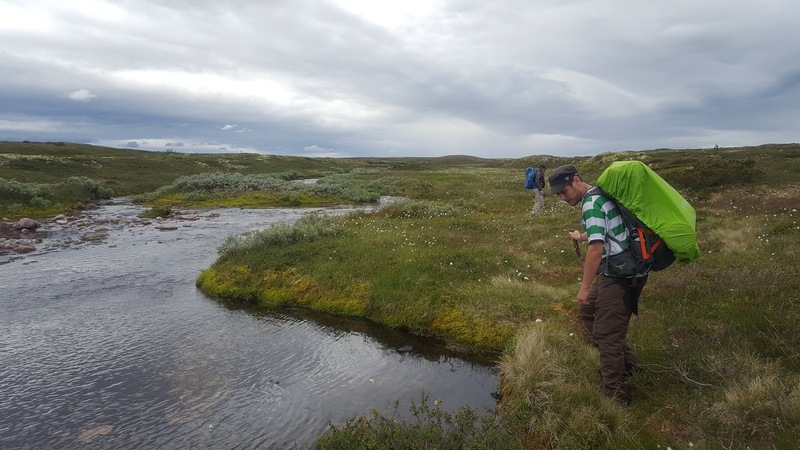 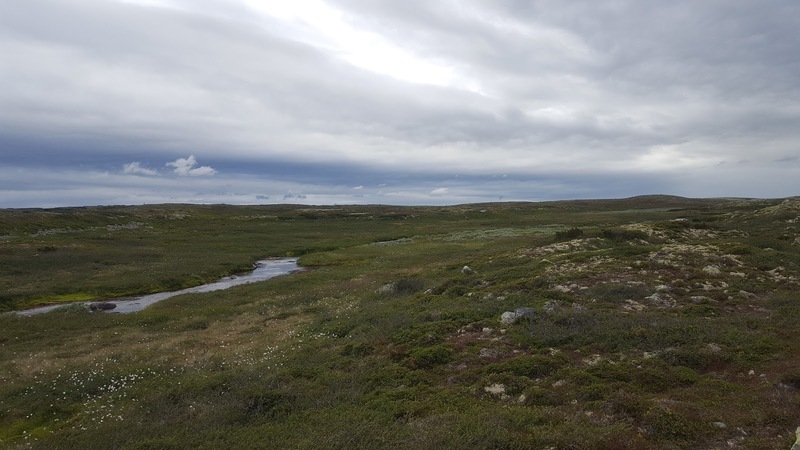 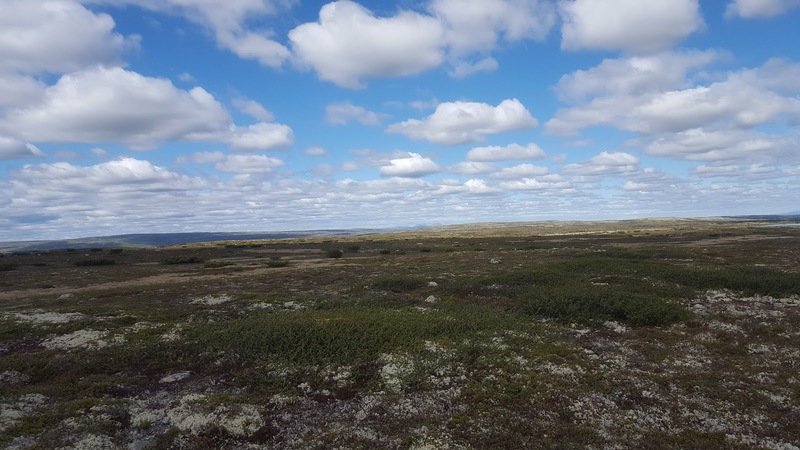 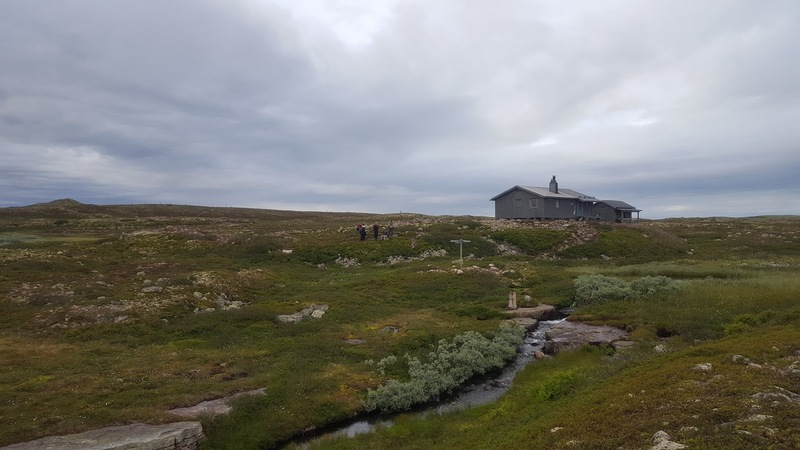 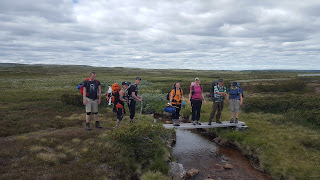 Unfortunately my friends and I did not have the time and exited the trail at one of the northern ends of Fulufjället near the hamlet of Mörkret after about 5 days of travel. Another issue is food supplies, again due to isolation and general lack of civilization on or around the trail. 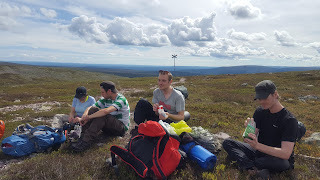 So make sure to have ample food supplies before setting off into this big patch of mountainous, wild nature. Getting to Sälen is easier, with daily buses going into town. 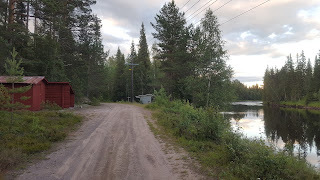 Mörkret however is another story, with its closest bus stop around 24km away in the village of Särna. There is a hostel/campground in Mörkret that offers a shuttle service for a small fee to and from Särna (we paid 150 SEK per car with 4 hikers stuffed inside). 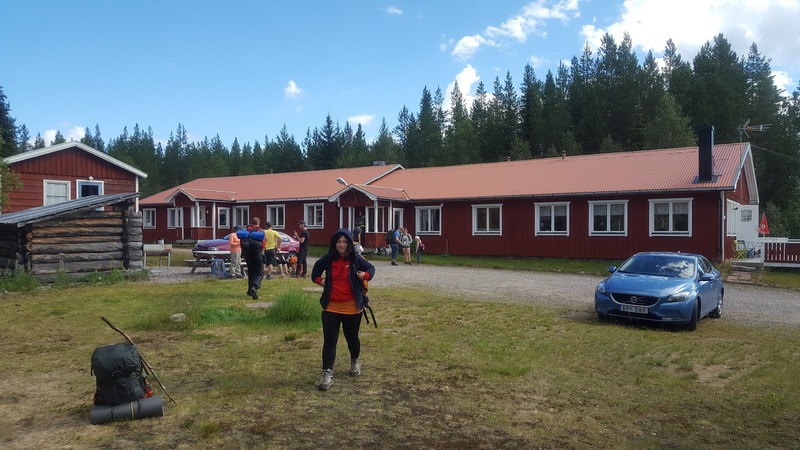 You will need to ask for this shuttle service, as it is not advertised, and here is a link to the hostel's website (in English). 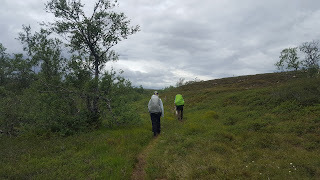 Going southbound the E1 trail continues on Vasaloppsleden, and you can read my report on that trail here. Going northbound the E1 trail continues on Södra Kungsleden, and you can read my report from Mörkret to Flödningen here. 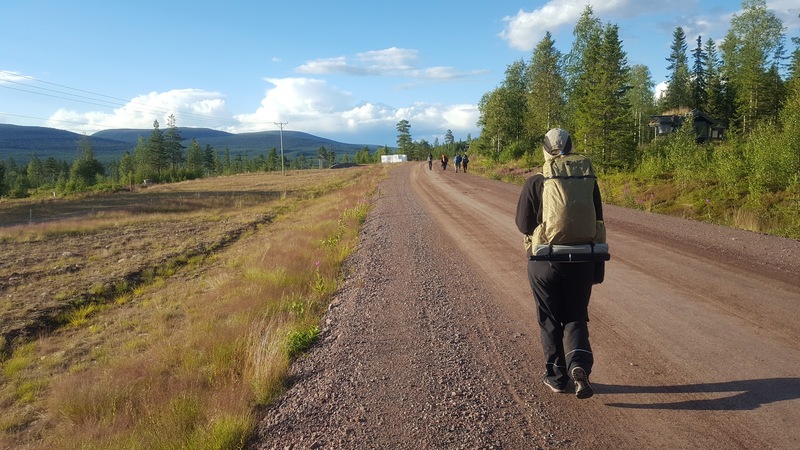 Please note that there is a roughly 20km transitional distance between Vasaloppsleden and the beginning/southern entry point of Södra Kungsleden, however you can take a bus from Sälen to the trailhead at Sälen Högfjällshotell. 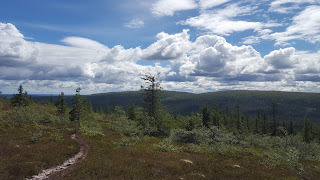 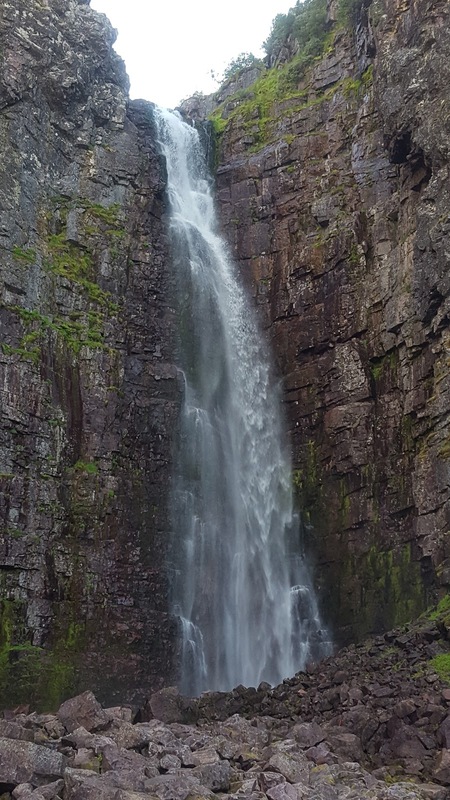 Having hiked all but the final stage of the entire Swedish E1 trails, let me start by saying that this is what I would consider to be the crown jewel of the entire trail system. 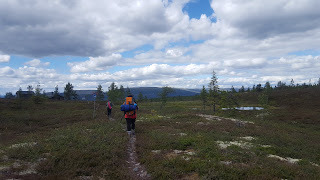 Granted we got lucky with good weather (mostly sunny, with very little rain--this is rare in the fjälls! ), and I had amazing company, but that being said this was easily what I would consider the highlight of not just the E1 trails, but one of the single best hiking trails I've ever done, period. 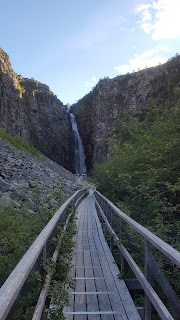 I took over 350 pictures and was absolutely enamored with this trail, though I will add that this trail is not for everyone. 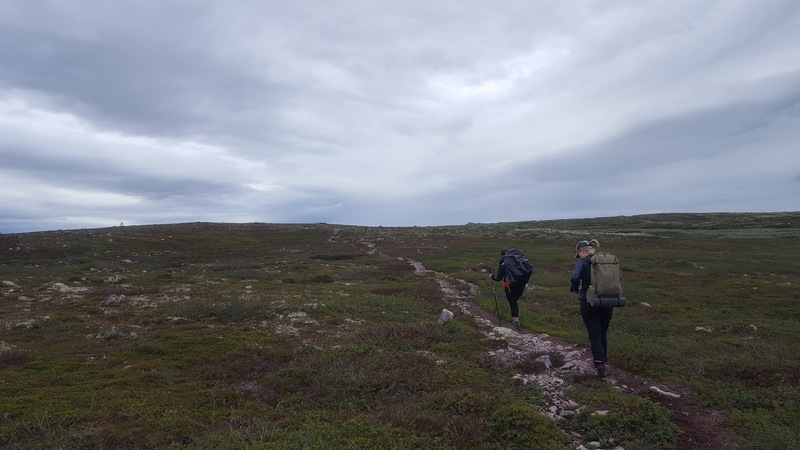 Aside from the logistical challenges mentioned above, the terrain is also challenging. One goes up and down small mountains again and again for the majority of this stage; and the trail itself, while wide ranging in conditions, has quite a lot of hard, jagged stones to hike on. 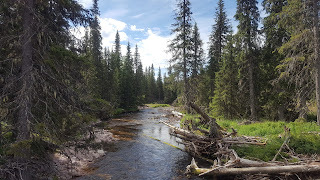 If you are there in the summer also expect to be eaten up by bugs to one extent or another, even if you are veteran and are vigilant with head net and bug spray and such. 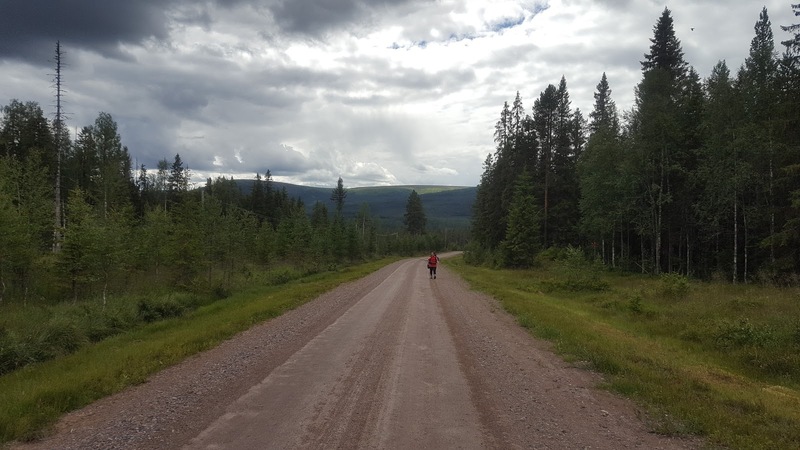 But with the hard work and enduring certain hardships comes many rewards. 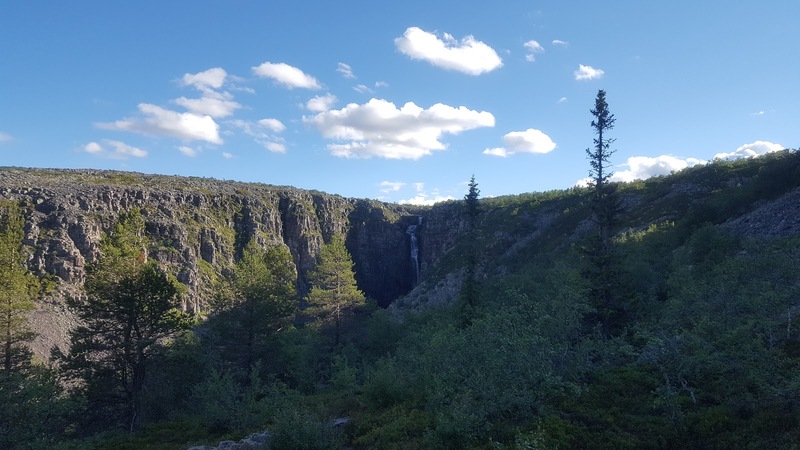 There are uncountable views, many of which are stunning, and some of which (if you are lucky and have good visibility) are jaw droppingly beautiful. 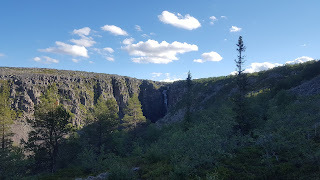 One of the reasons why it has taken me so long to write this trail guide in spite of it being nearly a month since I embarked on this journey is the challenge of choosing the best/most useful photos to include in this guide. 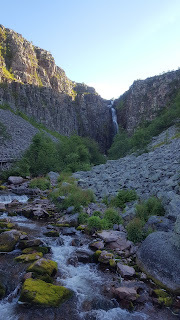 And forgive me for sounding trite, but this is a classic case of many of the photos not being able to do justice to nature. The wind, the smells, the reflecting/refracting light, the colors--this is just one of those vivid places that overloads the senses while you're there. Speaking of photos, in the photos you will often see my travel companions, who are my friends Julia, Mike, Ryan, Mikaela, Veronica, Alex, and my wife Karin (who was also with me on Vasaloppsleden last year). 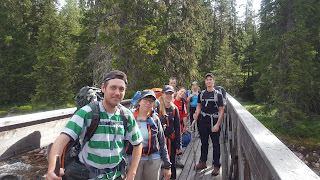 Thanks so much for coming along and helping to make this one of my favorite backpacking trips of all time, all you weirdos! 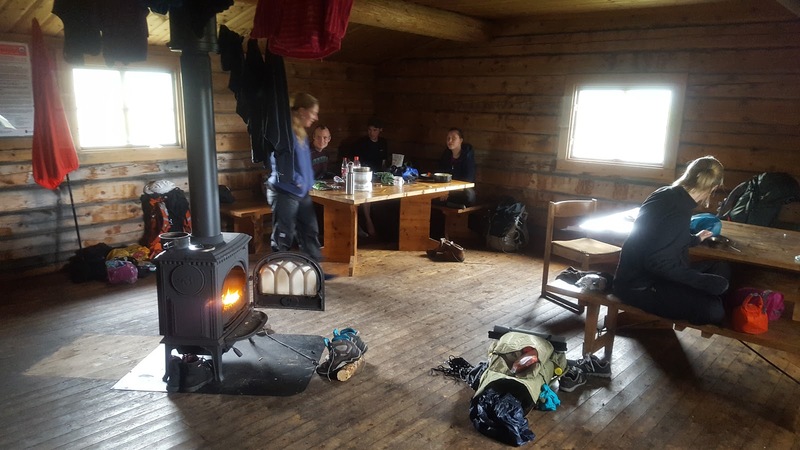 Our motley crew arrived at the trailhead after traveling for nearly 10 hours on several different trains and a bus ride, and were surprised to find a surreal little bubble of civilized convenience in the mountains. 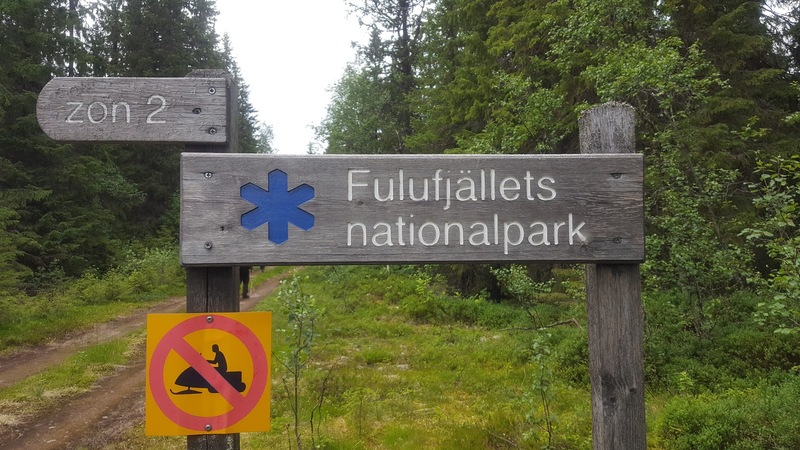 This is due to the high amount of ski tourism the area receives in colder times of the year, but in the summer most of the facilities are closed. They even have a McDonald's up there, I am sad to report. The only thing that seemed to be open was a small supermarket near the front of the trailhead, but it had just closed by the time we got there in the evening. Which was fine, as we were all stocked up and ready to go. The first few kilometers of the trail are actually paved with asphalt, for the tourists that want to take a quick stroll in the fjäll. 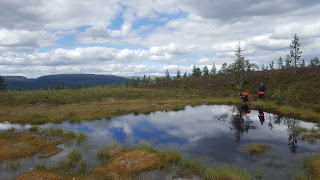 And shortly after starting the trail, the nice views began, and you'll find the first water source from a crystal clear tarn. 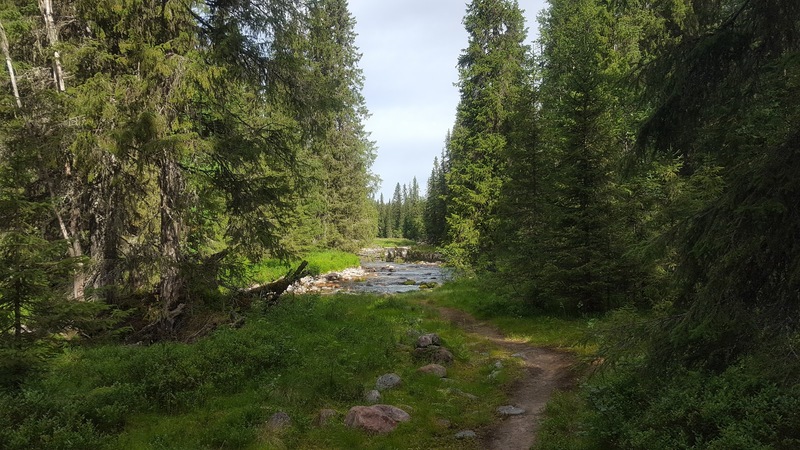 There will be plenty more views and good water to come--in fact, water is one of the few logistical issues that you don't really have to worry about much on this trail. 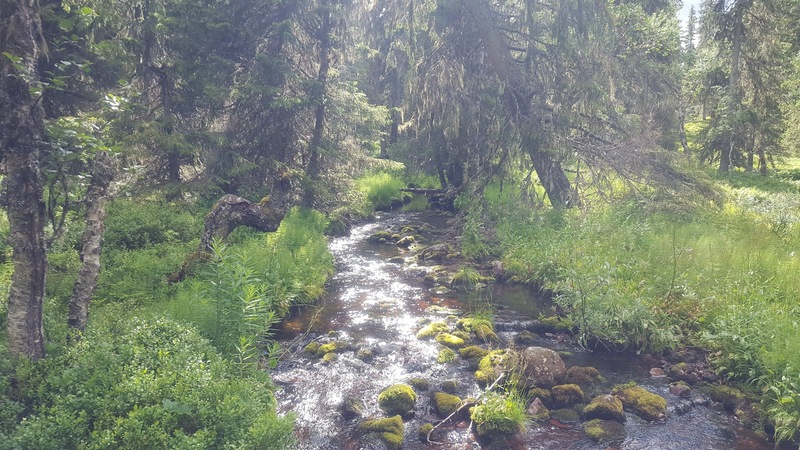 There is an abundance of water, much of it clear and clean and that you can drink directly. 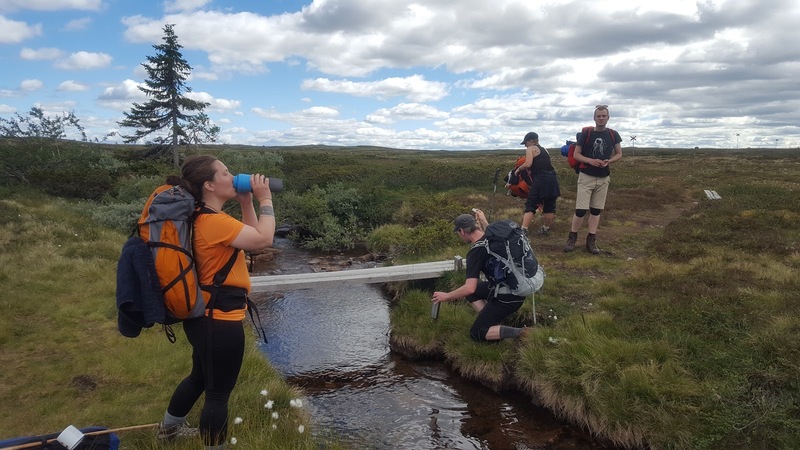 This is anecdotal to be sure, so take it with a grain of salt, but I've talked to many locals and hikers alike that don't filter or treat or boil any of the water they drink in the fjälls--and I've never once heard anyone tell me they got sick from the water. 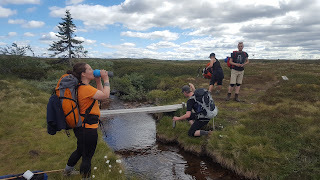 That being said, my friends and I did a pragmatic mix of filtering and drinking straight up (about 50/50 as a group), and none of us got sick or had any stomach issues that I am aware of. You pass a small trail shelter going north before coming to the first real cabin of this section, Östfjällstugan. It is a fine shelter and right on the banks of a tarn, and looking back I am a bit split about not staying the night at this shelter. 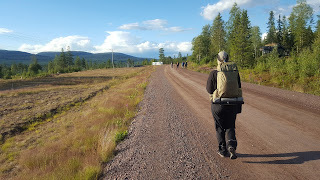 The group was full of energy and wanted to march on, especially me, so I am glad we were able to cover more ground. 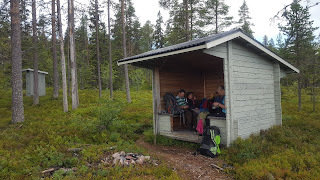 But the next cabin at Källfjället was not as nice as the one before. That being said, all eight of us were able to fit inside--though it was pretty snug--and get a good night's sleep. We were able to fill up on water and do our washing up in various little rain pools around the cabin, and in the end it proved to be not a bad place to make camp. Just not as scenic or spacious. 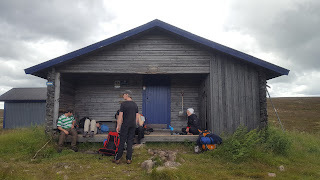 Though the hike there and immediately after this 2nd cabin were wonderful. 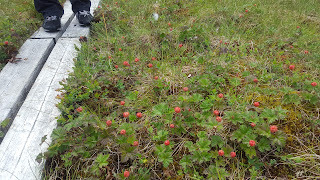 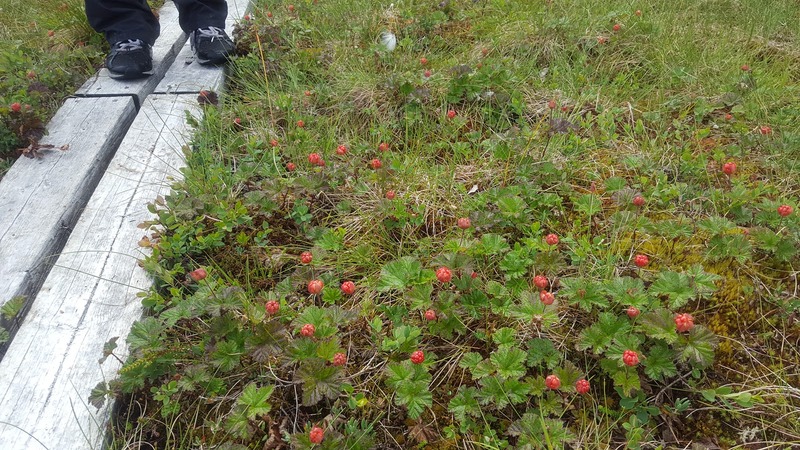 The next day we also saw plenty of wild cloudberries growing right on and around the trail, though they were not quite ripe yet (and even when ripe they are an acquired taste). 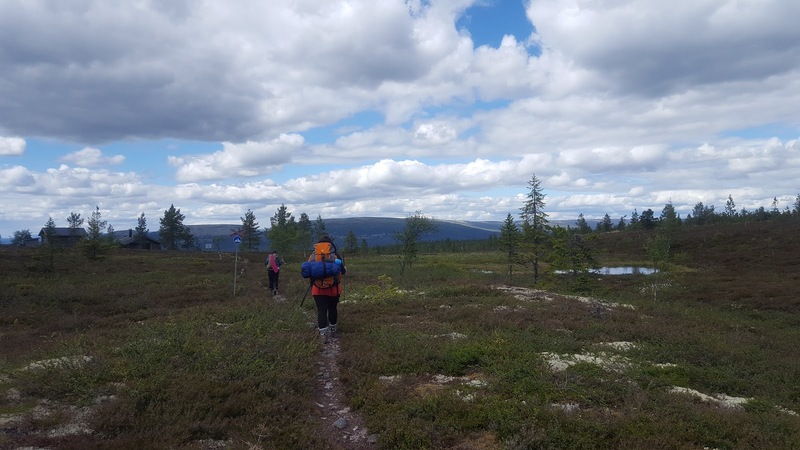 As the trail goes west through fjäll forests, it then climbs up a small mountain before soon going back down into more fjäll forests. 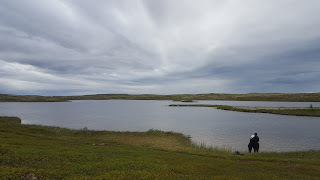 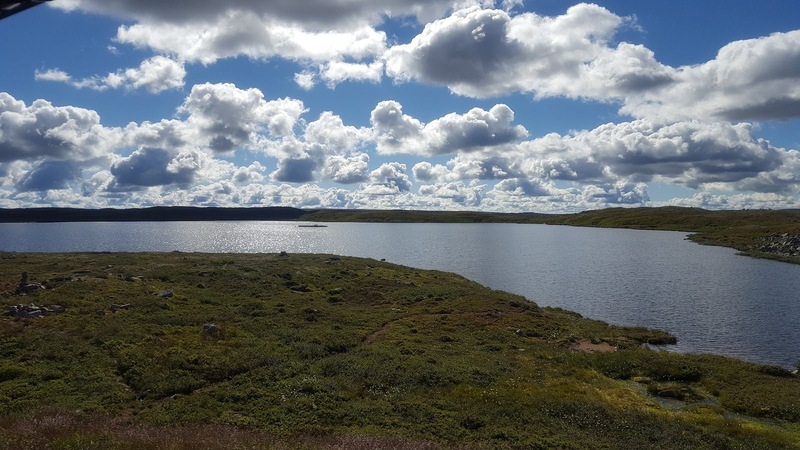 There are a few small, cold, strikingly clear tarns along the way that make for great places to take a break to fill up on water and/or go for a swim. Going back up another mountain, there is the quite lovely cabin Närfjällsstugan, which we enjoyed while we stopped for a long lunch break. 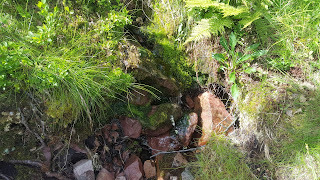 Close to the cabin is yet another conveniently located little spring to use as a water source. 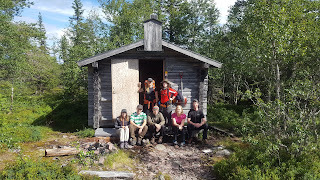 Past this cabin is more fjäll trekking, and a happy accident happened to us after I made a mistake navigating the group. 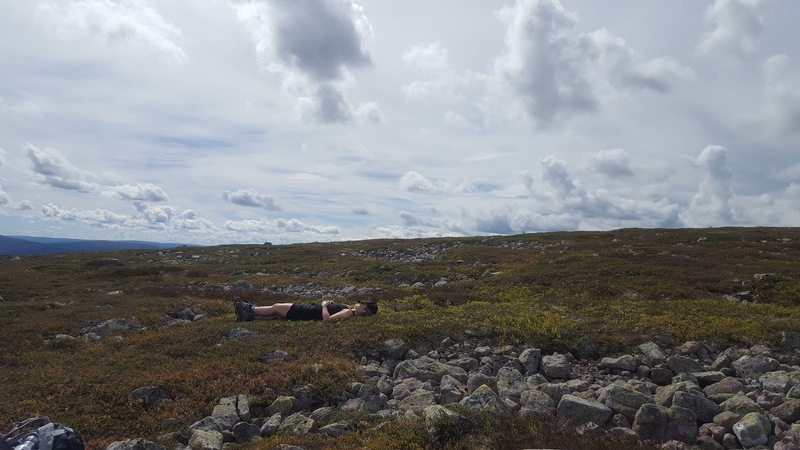 In fairness to myself, it's an easy mistake to make, especially considering that I was awestruck by all the gorgeous view around us. 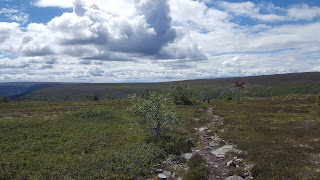 Here is the key detail: going north between the mountains Öst Granfjället and Väst Granfjället there is a fork in the trail, and one sign (pointing west) says "Granfjällsstöten" while the other (pointing north) says "Granfjällssätern." I confused the two and turned west, which was not our intention, though it actually proved to be an excellent little detour. Hiking west the views were stellar. 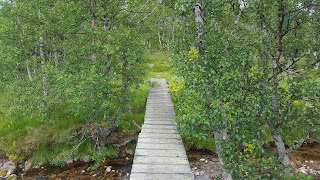 I will again note that weather plays a key role here, and we had amazing visibility. You can see for many kilometers in the distance all around, from mountains in the distance to rolling, lush, green forests in the valleys and dales. 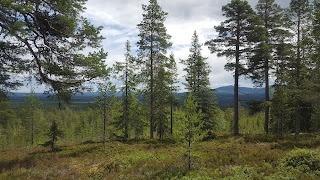 That's when I noticed some buildings in the distance, and realized we'd gone the wrong way. We hiked on and continued to enjoy the views, and then decided to take the direct route off trail down the side of the mountain towards the buildings in the distance. 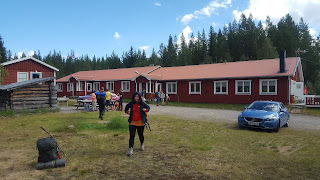 The collection of buildings is a ski hamlet called Stöten. 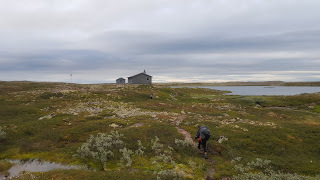 Soon after bushwhacking we found a marked trail leading into the hamlet, and as before everything was closed for the season. 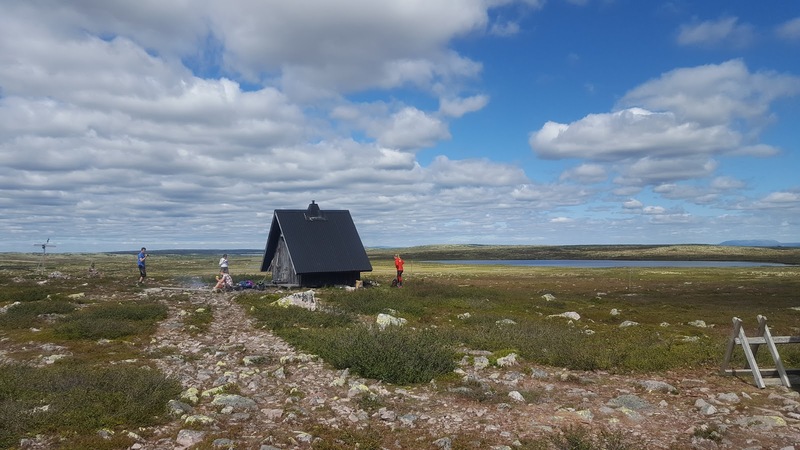 There are a few huts with grills that we used to take a break before moving on, but otherwise it's a ghost town with no other shelters, bathrooms, or anything else. A gravel road runs through the hamlet, which we followed north to a dirt/grassy road going east. 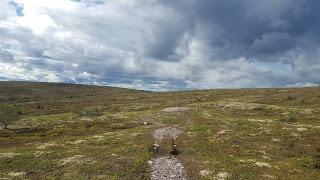 On my map there was marked a trail shelter on this grassy dirt road, but there was no shelter to be found. Which is no big deal because there is an excellent campsite just ahead after reconnecting with the trail. The trail goes north through a big bog (your feet will get wet) and then passes over a handsome bridge over a surreally scenic river. 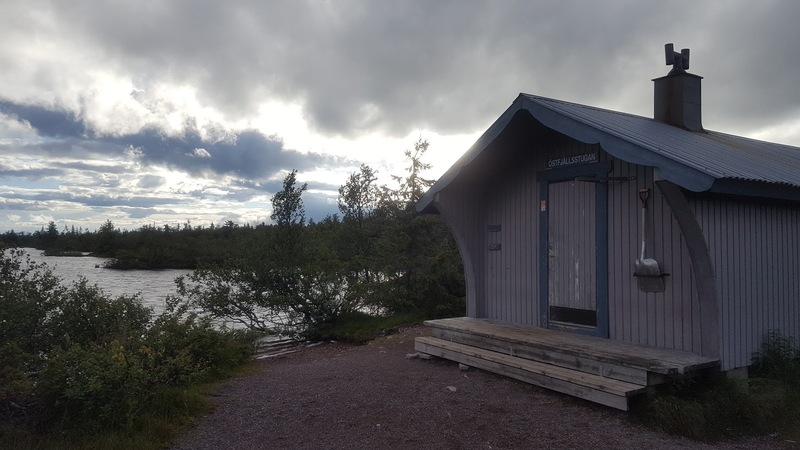 On the north banks of the river is an outhouse, plenty of flat ground to set up tents and such, easy access to the river, and a small trail shelter called Lillbäcksstugan. The shelter could maybe fit one or two people inside, so we didn't bother to use it and instead all set up our tents on the grass by the river. 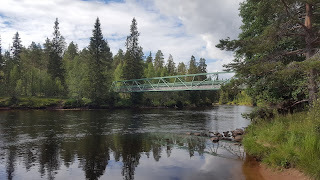 There we had a fire and a lovely stay by the river, with more swimming and resting before carrying on the next day. 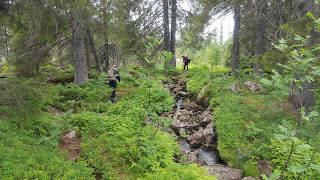 Hiking north there is a short road hike, more forests for a stretch--with lots of blueberries in the summer, we all had our fill of them on various berry picking breaks--a small trail shelter that is not marked on my map, then the trail goes between two small mountains to another cabin called Lilldalsstugan. 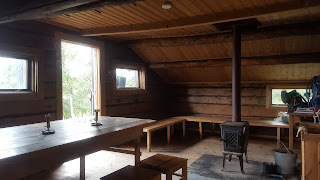 This cabin is one of the nicest shelters I've ever been to, and we had a good, long lunch break there. 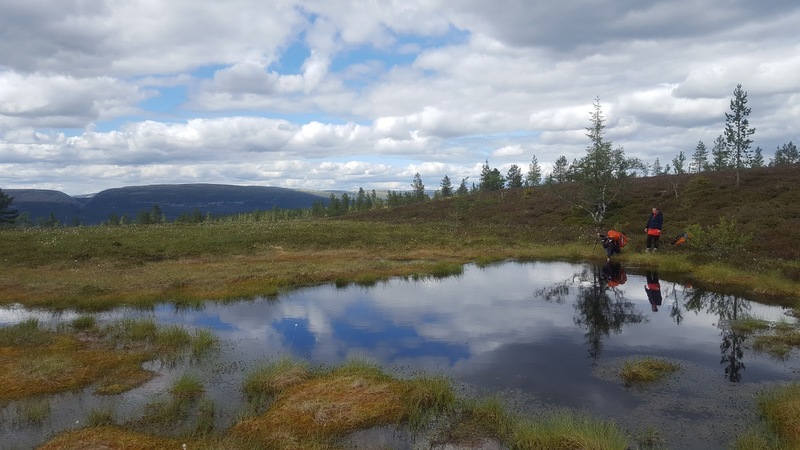 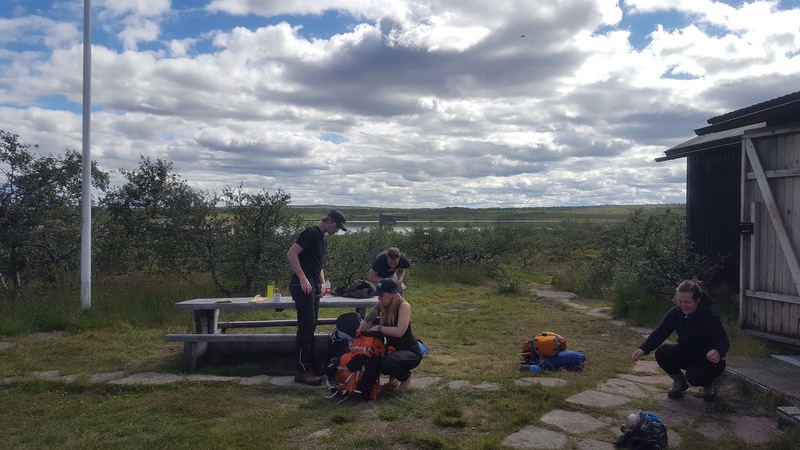 There is an excellent wood stove, it's very spacious, and about 25 meters or so from the front door there is a marshy tarn with good water--though it's a bit tricky to get water without sinking into the marsh. 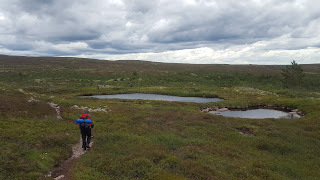 My advice is to walk around the tarn on the south side to the back of the water where there is a small hill, and it's easier to fill up on water. At this cabin there are also spectacular views all around. We all wish we had more time to stay an extra night there, but we had to stay on schedule to catch our trains home at the end of the week. 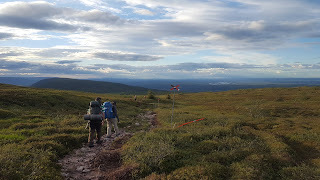 Fulufjället is not far away at this point. 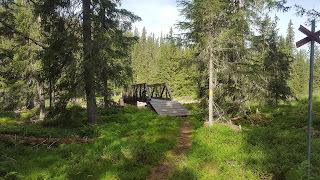 Hiking northbound however there was some minor confusion with trail markers just past a bridge going over a creek. 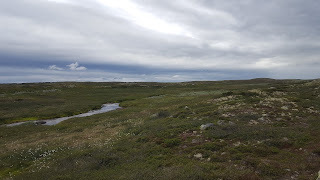 We ended up in the hamlet of Storbron, but just hike north-west at the fork in the dirt road and the trail will soon present itself again. 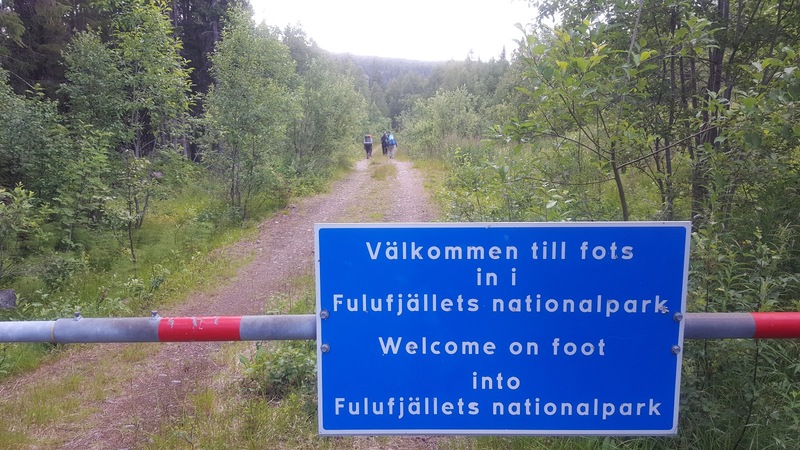 Hiking southbound you probably wouldn't have this problem. This would be the first of a few issues we noticed with a lack of trail markings in this section of trail, though it's nothing that experienced or even somewhat experienced backpackers can't handle with map and compass. 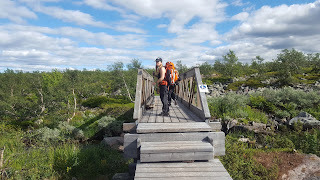 And finally we arrived at Fulufjället, and it's beautiful from the first step in until the last step out. Truly one of the most exquisite places I've had the privilege to walk through. Soon after entering the national park, there is a fine cabin at Björnholmssätern that is a stone's throw from a river. 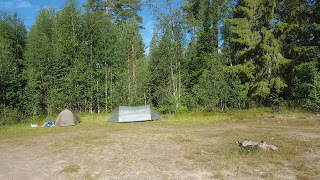 Be warned if you want to sleep in your tent outside or if you are forced to if the cabin is full, that even though there is flat ground outside the cabin, it is quite hard and full of stones. 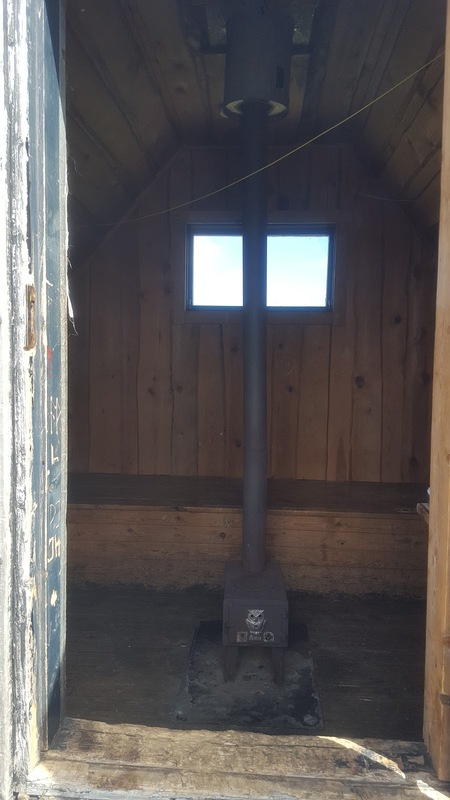 Makes setting up a tent difficult, especially when you add a cloud of blood-sucking midges and mosquitoes surrounding the cabin. There is a good wood stove inside this cabin as well, and when we got there other backpackers had already started a fire. It was toasty warm inside, and a very comfortable cabin with many beds. I spoke to a few German backpackers going southbound, and we traded tips and trail information. 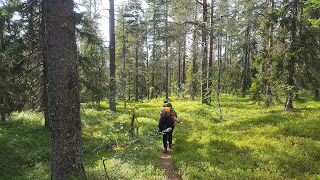 They let me know that they and other backpackers noticed some issues with trail marking, pointing out the north-west area of the park as problematic. 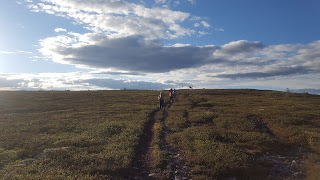 My group and I didn't make it to that area--we would go generally right through the center of the park going north, with a short eastern hike to exit the park. 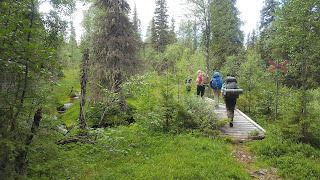 Though shortly after leaving the cabin we would experience some confounding issues with certain trail markings. 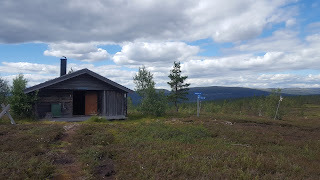 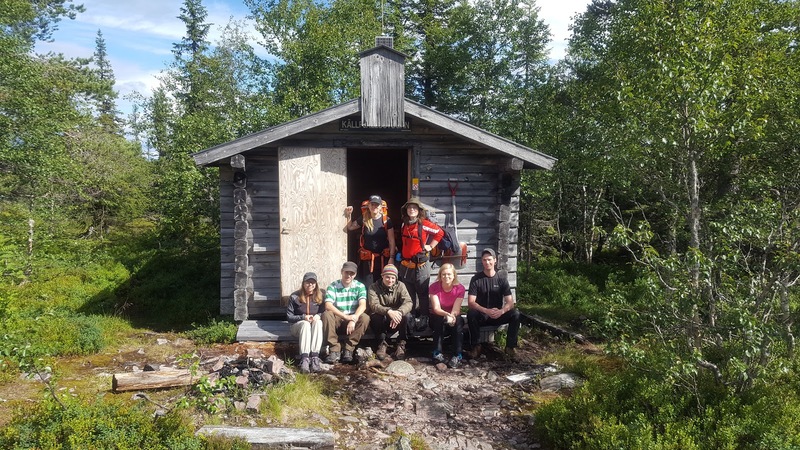 We had originally planned on taking a side trail west a few kilometers past this cabin, where we could hike into the Norwegian side of the park for a bit before looping back north back into Sweden again. 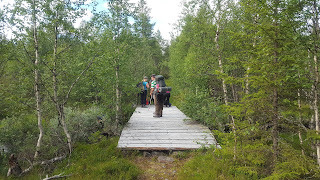 However as hard as we keep our eyes peeled, we could not find this side trail--and this is eight people searching, fully rested and fed and watered. On the map we used there are three general symbols for trails. I won't get into all the specifics, as it would take up too much space here (not to mention boring to write/read), but two of the three trail symbols usually meant no trail at all or a very faint--often unmarked--trail. 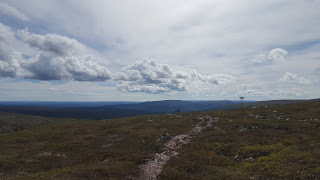 Thus we didn't make into Norway, but it was still a wonderful hike up our biggest mountain yet. 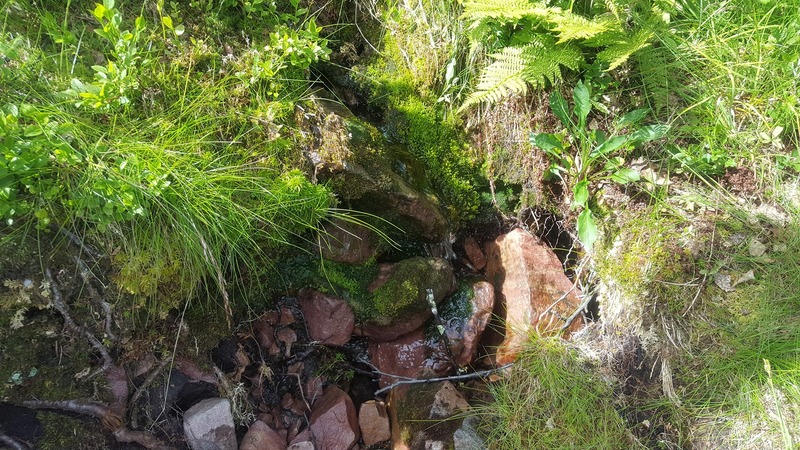 We also discovered a tiny spring coming directly out of the mountain, and all enjoyed what was perhaps the best water I've ever had in my life. 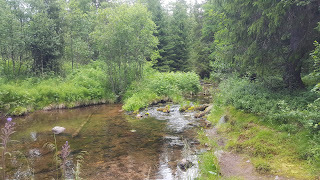 Pure, cold, clear, spring water flowing out of a mountain in a nature reserve in Sweden. 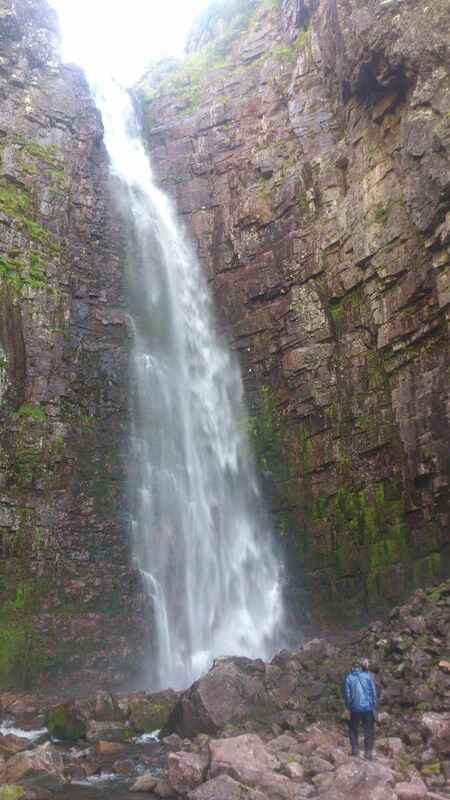 Hard to get much fresher than that. 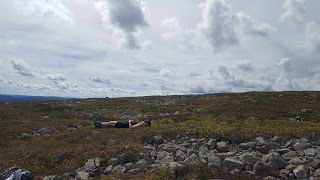 On top of the mountain we took a much needed break and once again soaked up the eye candy 360 degrees around us. 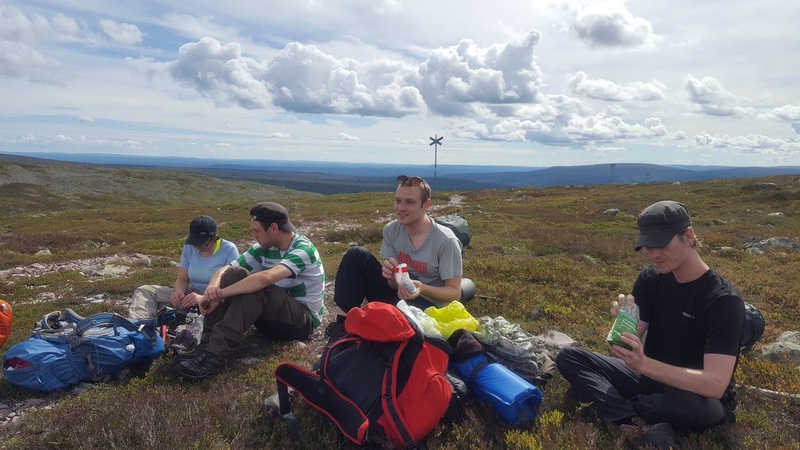 Another nice aspect of being high up in the fjäll is a huge reduction in biting, stinging bugs, so relaxing is easier up there. 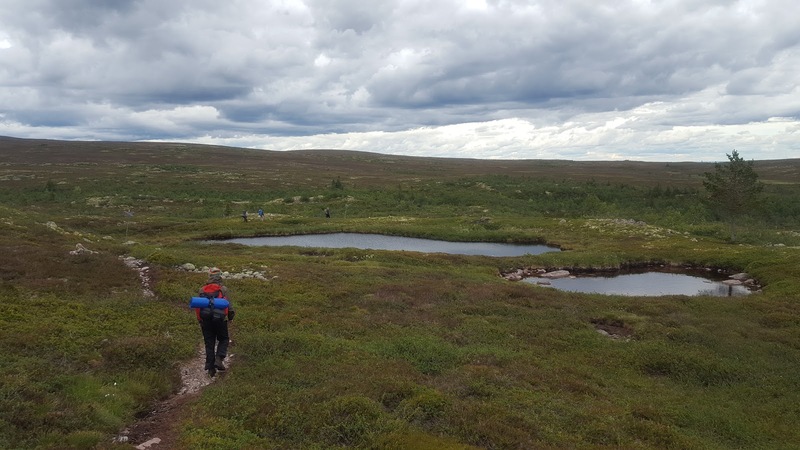 For a while you're on the plateau of the mountain, walking into the vast, open space of the fjäll. 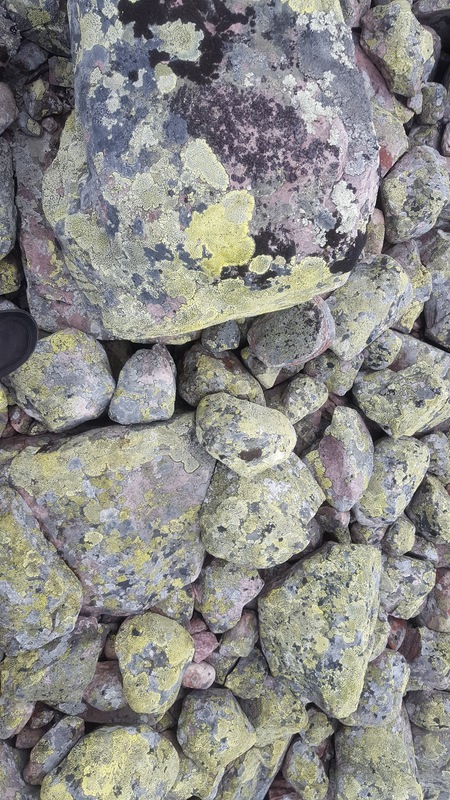 Hardly any trees, and tons and tons of gnarly stones, many covered with bright, lime green lichen. 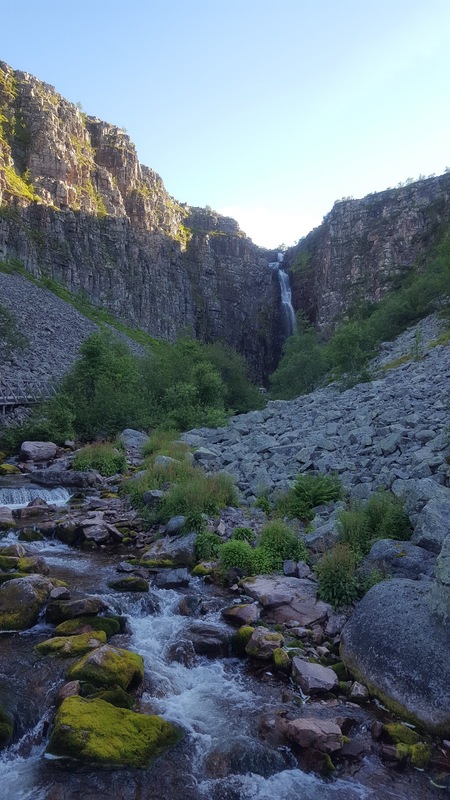 Almost a frightening kind of beauty--a strange emptiness, yet at the same time when you take a moment to pay more attention, a million details begin to pop out and appear. 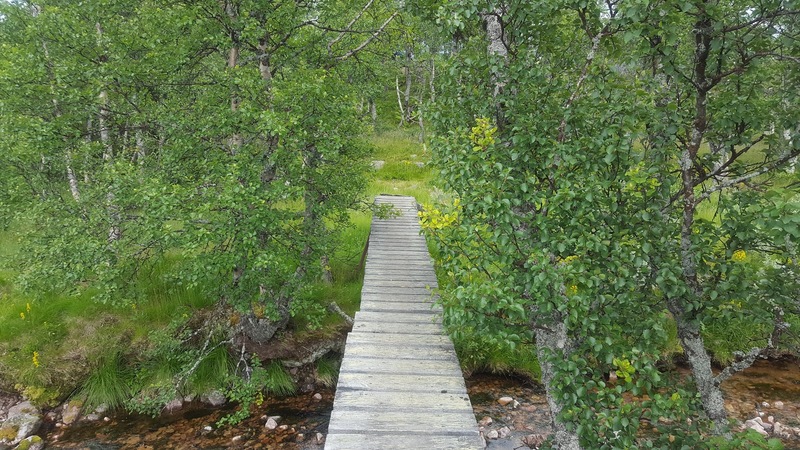 Then the hike down into a tiny valley, where yet another cabin, Tangåstugan, waits next to a forked river of even more clear water. 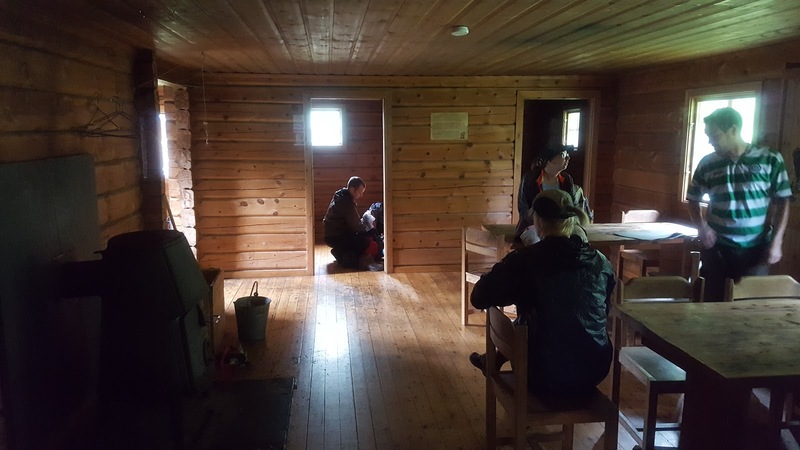 It's a nice cabin, though smaller than previous ones. 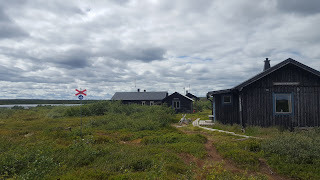 A sign points behind the cabin towards the next cabin, which was our goal for that night. 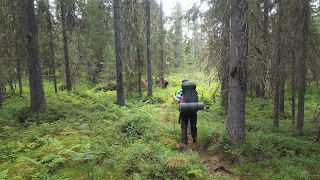 Heading off, it rained for about 15 minutes while we followed the trail, and the trail followed the river. There were no markings, just a trail, which became fainter the further we hiked in this area. 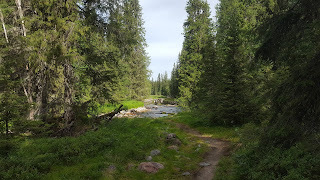 Eventually the trail just ended at a bend in the river. We decided to split up to try and find the trail again. So long as you follow the river, you can't really get lost, as the source of the river are a set of lakes close to the next cabin. 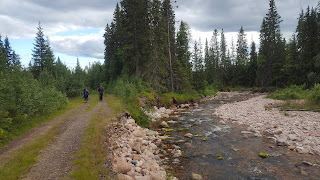 I spotted what looked like small man-made rock marker in the distance, found a narrow spot on the river to take a running jump over (I made it), with Mikaela closest to me to the west. 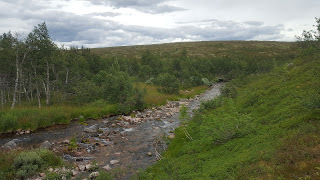 She had forded the river earlier and climbed over a hill and spotted an unmarked trail, which took us to the lakes. 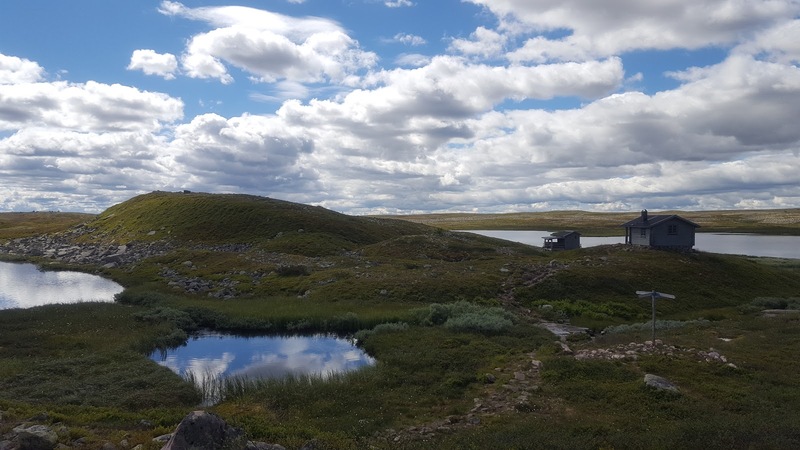 On one of these lakes are two cabins, one was locked, and the other one is Tangsjöstugan, and was another remarkable shelter. 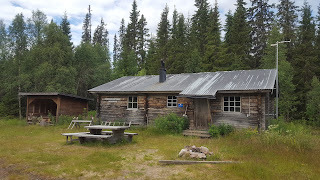 This cabin is yet another one of the very best campsites I've ever stayed at. 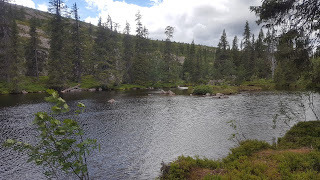 There is a lovely tarn some 20 meters from the front door. The tarn was so clean and transparent it looked oddly fake--almost cartoonish or CGI. Though not in a bad way, but in a fascinating, surreal way. 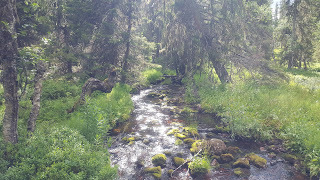 Swimming in it I will remember for the rest of my life. 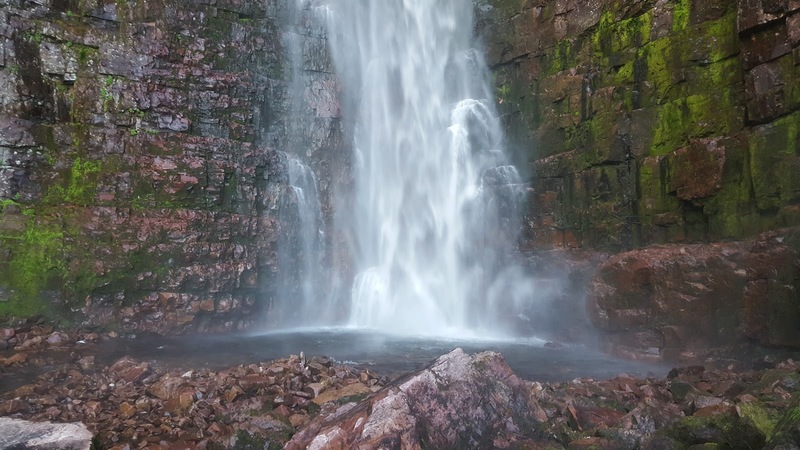 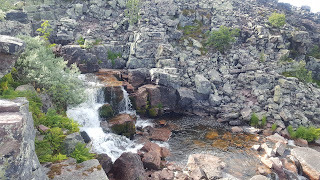 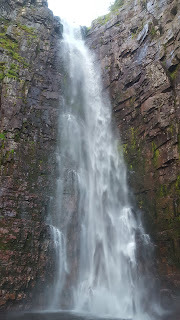 There is a tiny waterfall that connects the tarn with the other tarn nearby, some 100 meters away or so. This cabin was the most full of backpackers, but luckily there was just enough space for all of our crew plus the travelers already there. 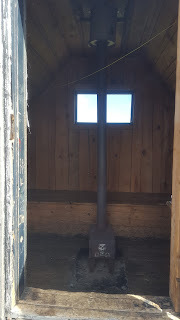 There is a wood stove there as well, and as before we slept toasty warm. The next day was more fjäll plateau hiking, and the more north we hiked the more hikers we saw. A fair amount of day hikers, which means we were getting close to the edge of the park again. We passed the small cabin Särnmanskojan and a few more mountain tarns before rounding the east side of the larger lake Storrörsjön. 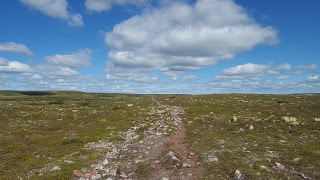 It was on this stretch of trail that in the distance I spotted that there was still some snow left on the slope of a distant hill, though with the sun shinning I wasn't able to get a good picture of it unfortunately. 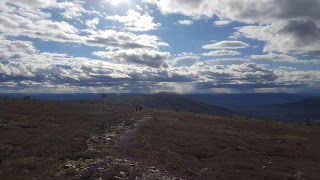 At Rörsjösstugan if finally feels like you're back in civilization again. 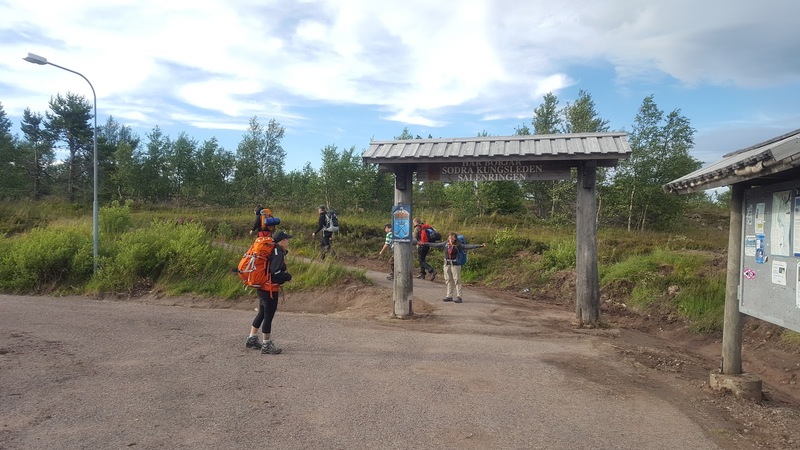 Lots of day hikers and thru hikers alike, and some fishermen and tourists too. 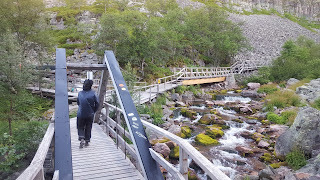 There is a small kiosk where an old man sells drinks and snacks and the odd knicknack. 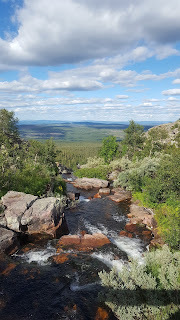 We ate lunch there, continued to enjoy the pleasant, sunny weather, bought some overpriced beer and sodas, and were off again to see Sweden's highest waterfall--from above and below. What a way to end our trip. 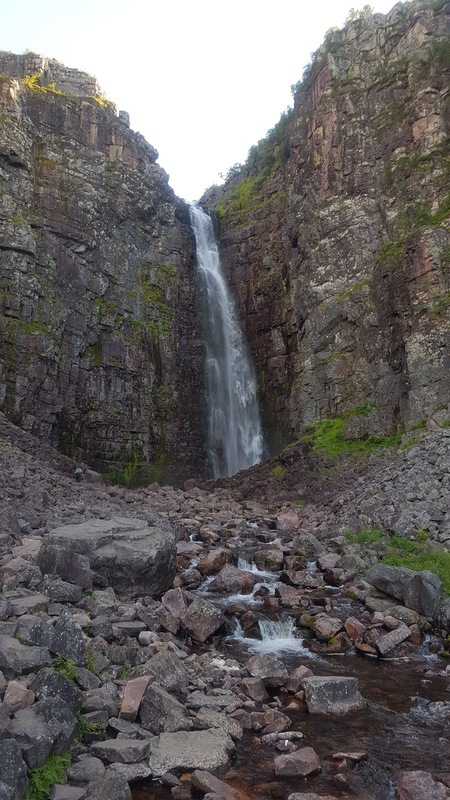 Njupeskär is around 93 meters tall, and is awesome. 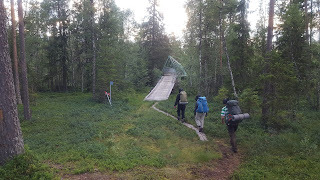 I won't say much more and let the pictures do the talking, but first some pragmatic information about the last bit of trail out of the park. 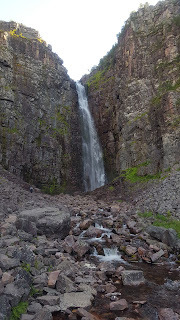 There is a small cabin close to the waterfall, too small for the eight of us to fit, so we continued on. The second cabin close to the north-east entrance of the park has a sign saying that it is not for overnight use, oddly. 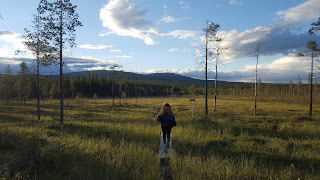 So after we got to the end of the park, we hiked to the hostel we had booked in advance in the hamlet of Mörkret, which is about 3km from the park. The facilities at the hostel are good. 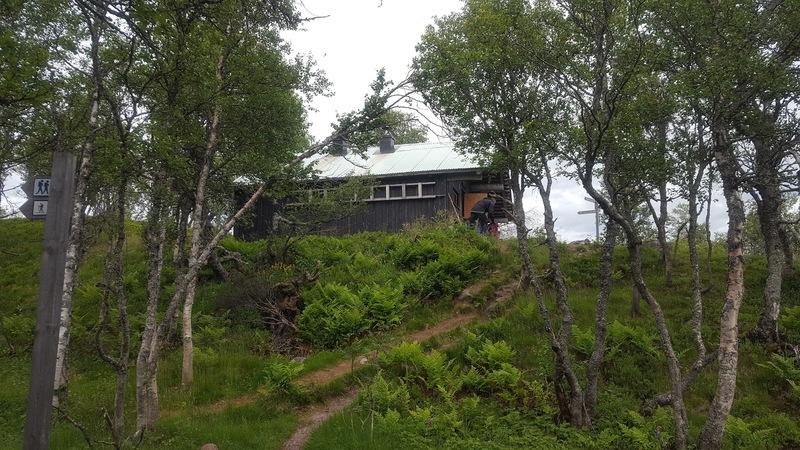 There are showers and a kitchen and large living room/dinner room area. 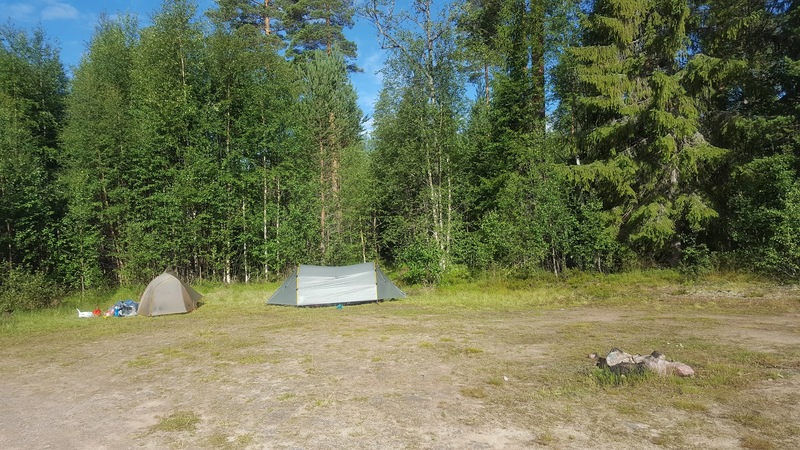 You can ask to pitch a tent on the grass if the lodging is full (which is what we did), and we were charged 100 SEK per person, plus we could use the facilities. 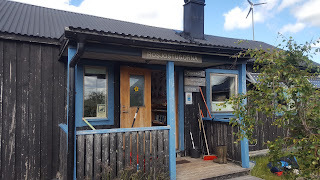 Friendly staff and good contact via email for bookings. 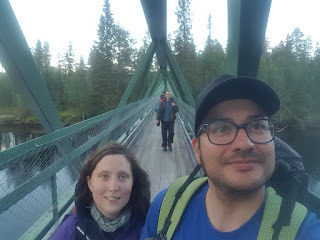 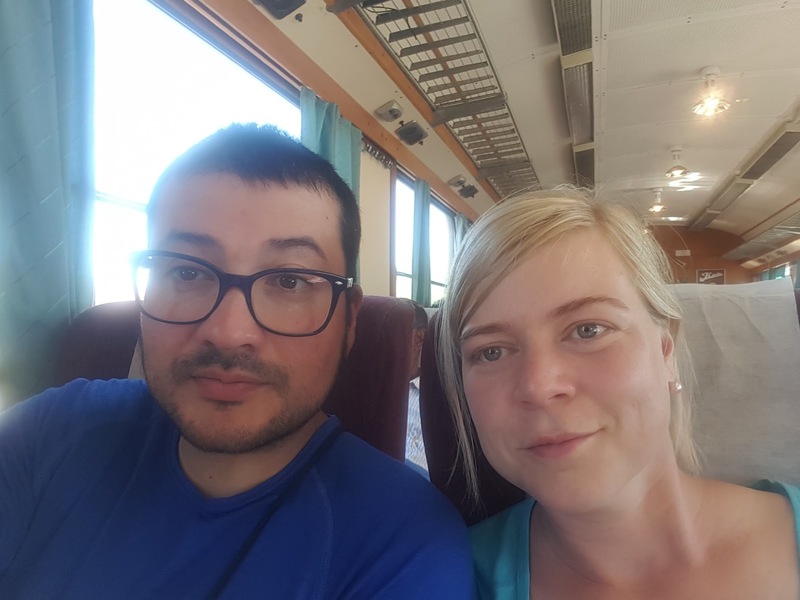 The next day we got a shuttled to Särna and took a bus to Mora to catch a train home.